Spoke too soon – had to get the T-shirt, shorts and flip-flops back out as the weather has returned to (slightly) Scorchio! 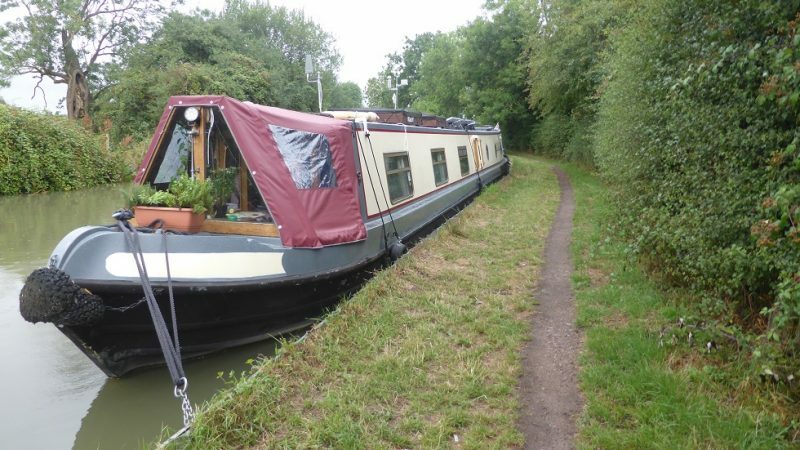 Just as well as we’re due to have new batteries and sit out for a few days at Springwood Haven – a few miles north of Nuneaton. 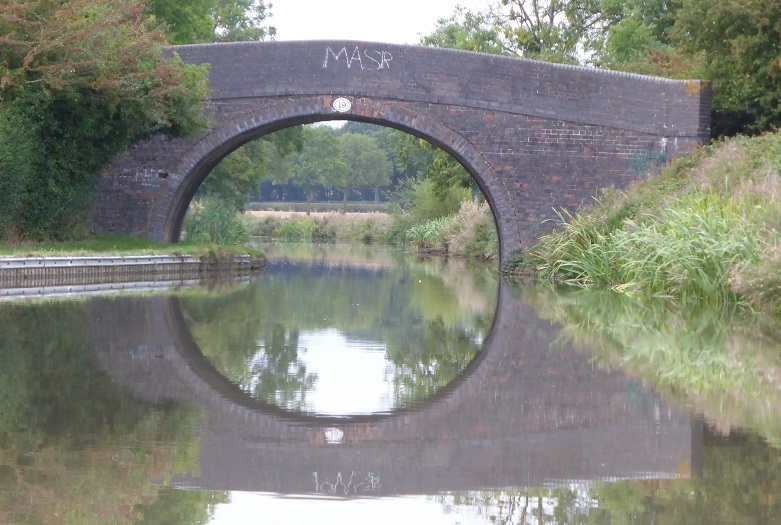 So, it was a sad Goodbye to the Ashby Canal and up the Coventry. 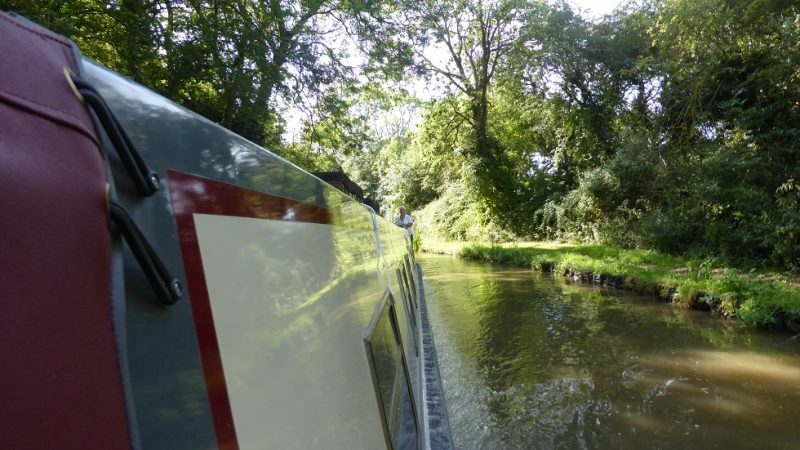 Boy was it busy – boats in front, boats behind and plenty to the side as we bimbled along on tick-over. We arrived around lunchtime and Steve went over to Springwood Haven to meet Kevin of Onboard Energy, who said we can move into the marina early tomorrow, in order to “do” the batteries. Bridge Zero(?) – the end of the Ashby – turn left normally here but we turn right. Meanwhile, Friday morning looms and Steve’s all of a quiver – he does fret so but then this is a big day for Adagio – we really depend on these mega, humungous leisure batteries. Above and to the right, is the slightly smaller starter battery (which had to come out too) and to the left is the 65kg 200Ah Victron AGM battery! 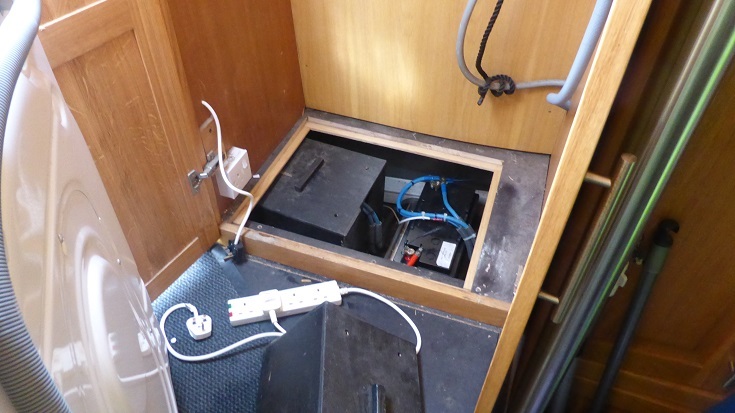 Here’s the other two – a bit easier to get out but all the wires had to come off first. And remember which way they went. Bit of a pickle isn’t it? 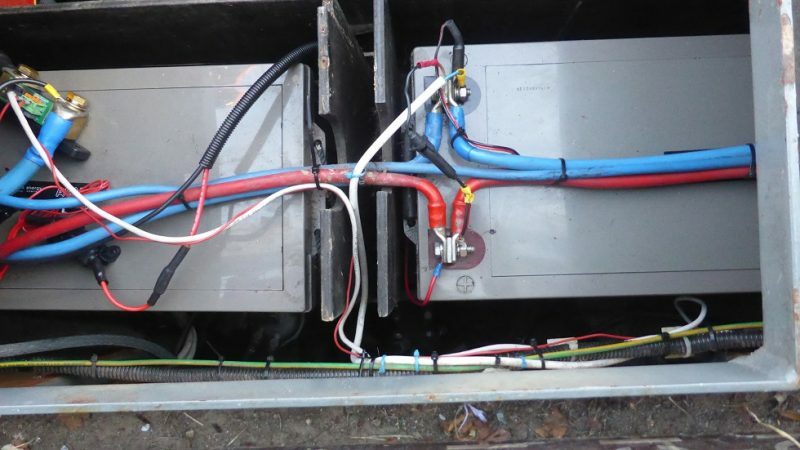 Big thick cables carry the main supply in and out, whilst the smaller cables are usually things like the solar input or voltage monitoring. The gadget on the right is the Victron BMV-712 battery monitor! One battery out . . . just two to go . 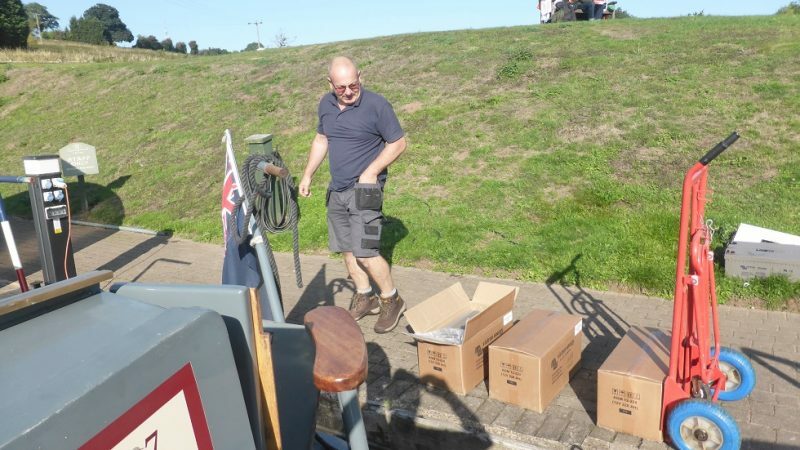 . .
Here’s the famous Kevin – using a sack trolley to bring the brand new and boxed batteries. He must have some muscles – he didn’t need much help in manoeuvring these beasts into position. He’s done this before. The whole operation plus the rewiring, checking and replacing all the gear (washing machine etc) took four hours. But at last it was done and after lunch I went to pay – £422 each those batteries!! But they should last for another ten years and NO maintenance. 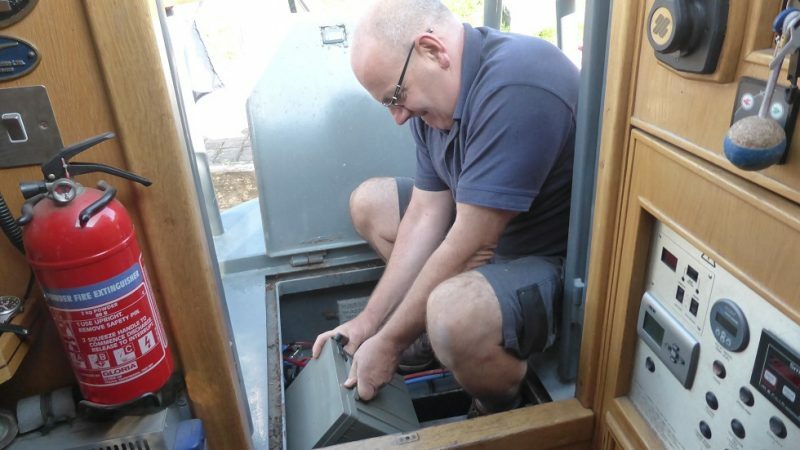 Kevin also lowered a cable out of the window so we could plug in the Victron charger/invertor – to reconfigure it to the new system. Great. 660 Ah to play with now. Woohoo!! We just drove around the corner 200 yards and re-moored, pretty close to last night. With oodles of sunshine forecast for the nest 3 days, we’ll stay put and Simon (Empress & Toby2) is not far away and intends to visit later. Good oh. 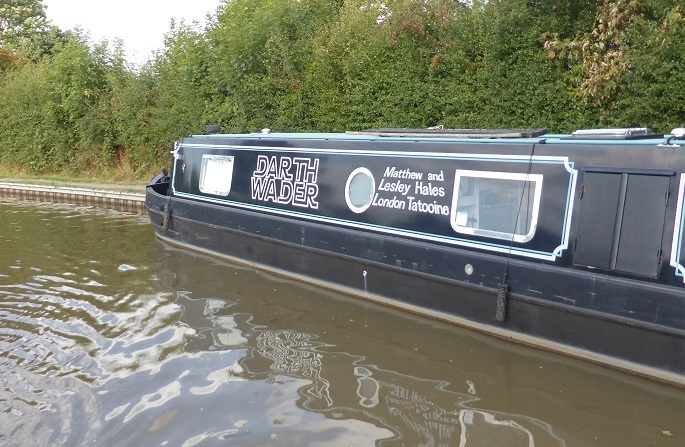 Another curious boat – Darth Wader, very good. Goodbye flip-flops, shorts & T-shirts – Hello new batteries! 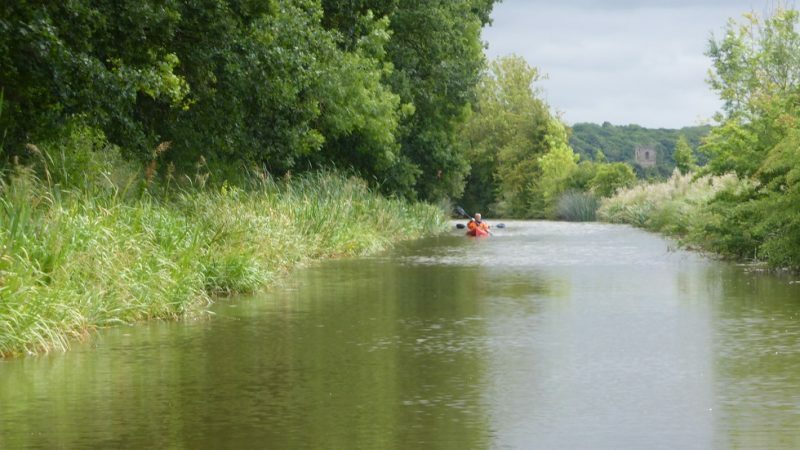 After two days at bridge 19, we decided to move off to bridge 3 – nearing the end of the Ashby. There was a bunch of kids – could only have been around 12 years old – chucking stuff off bridge 19 onto passing canoeists and boats. They were spitting onto the crews below too! What is it with kids today, eh? Our neighbour on Nuffield, went off in pursuit but they had bikes and legged it. Little charmers. 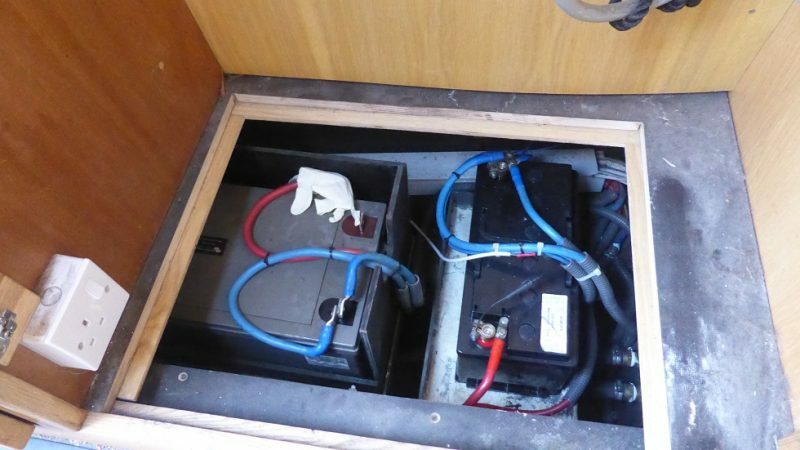 We’d sent an email to Kevin at Onboard Energy re new batteries but have heard no more. 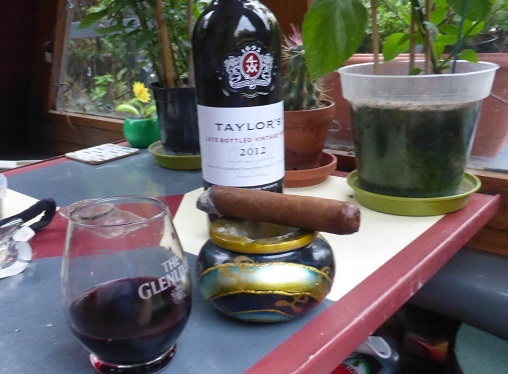 So time to chug on – engine purring nicely, no problems! Viv was driving for a bit, so Steve sat up at the front, making a fuss of Toby. 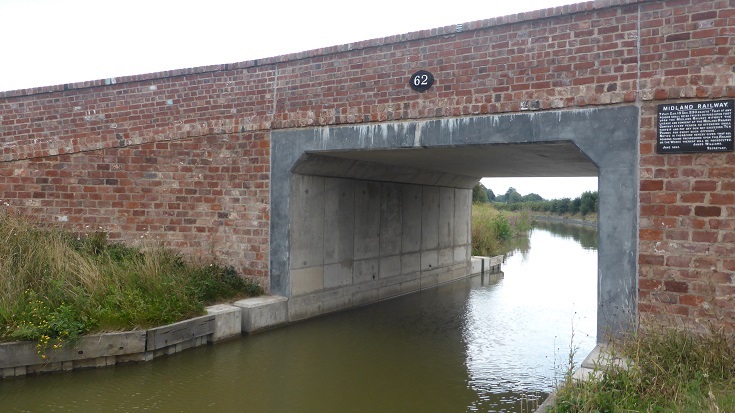 Goodbye to bridge 19 – sans les animaux! 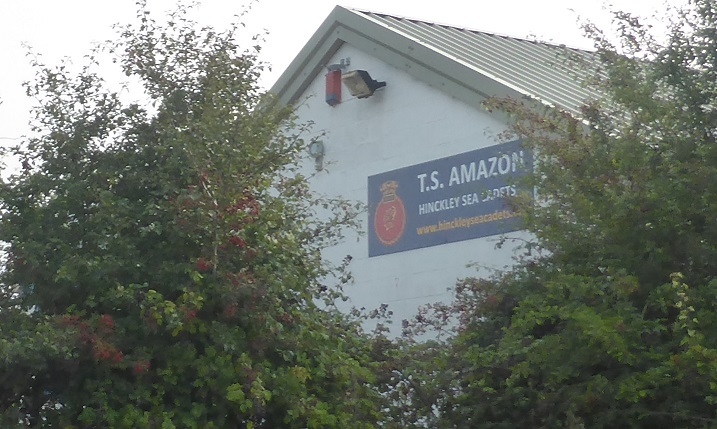 Here’s the small wharf south of Hinckley, with a small lake and the Sea Cadets next door. 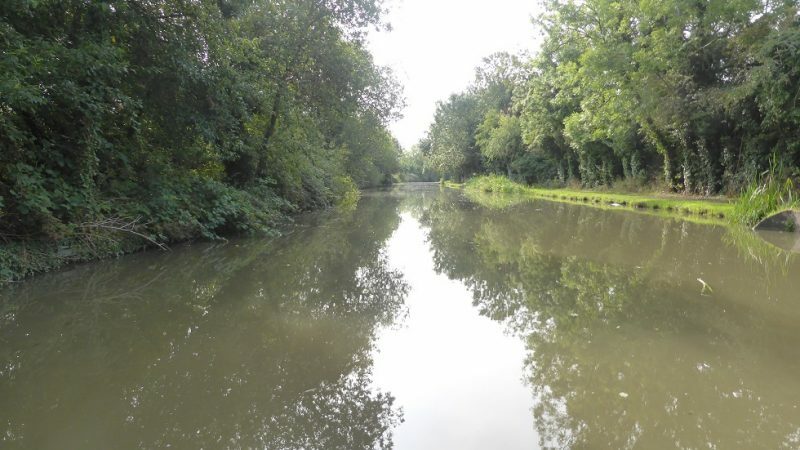 The Ashby canal can be shallow, narrow, twist & windy but also has some nice wide bits. Marvellous stone bridges but most seem to be cracked and looking like they’re about to collapse. Well, stopped just after bridge 3 – nice spot. 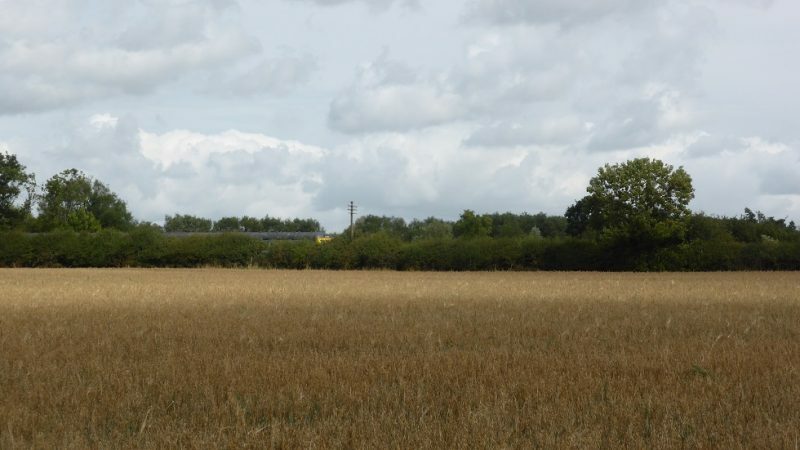 Trains in the distance but otherwise quite rural. 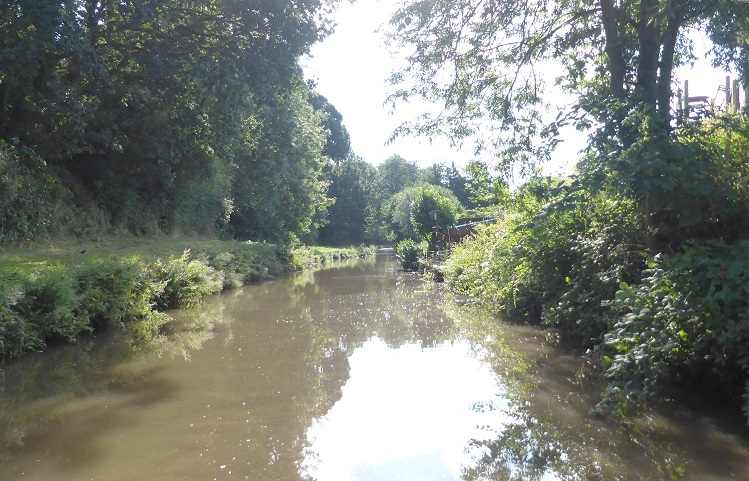 And just as soon as we stopped, Kevin phoned – he had our number, for we were on his database! Yes, he has the batteries and can fit us in on Friday. Yippee. 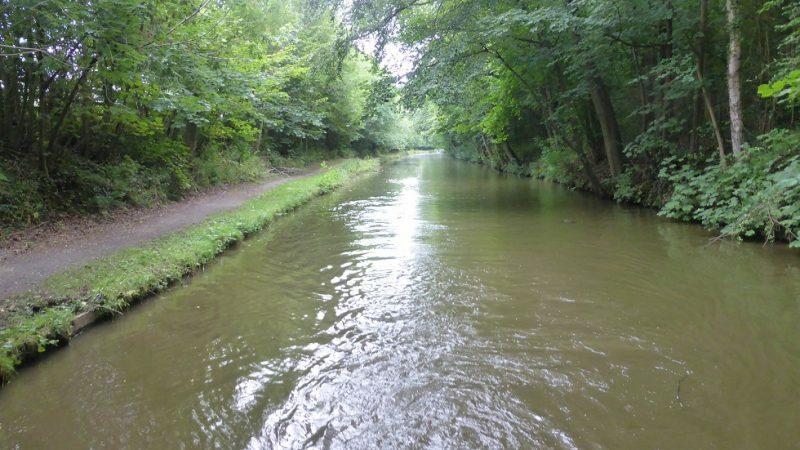 So that’s good news – just 2 hrs chugging, turning right instead of left and we can moor at Springwood Haven. Definitely Autumnal – a heavy dew on the boat but a pleasant start to the morning. We met the boat “Boo” with the two spaniels. We last saw them at Springwood Haven where they were waiting for a new engine to be fitted. All done now and they are out testing it. Woe ! And thrice Woe! There are highs and lows with boating. This weekend saw a few lows for us – near to tears at times. You heard, last time, that the solar controller was not happy – it saw a very low voltage (8 volts and not 12) and so shut down. The batteries are very old (10 years) and are becoming more and more senile. With the new Victron battery monitor, we can estimate that they are only at about 50% of their original capacity (600 Ah down to 300?). And it doesn’t take much to eat into that . . . the fridge eats about 4 amps continually and then we do watch TV, run videos etc . Several mornings now we’ve heard the “baby crying” – the new gauge gives off a pathetic beep-beep, when the voltage gets to 50% (12.2V). And then the engine – our mainstay, started to throw a wobbly – it sounded like it was about to choke and die! 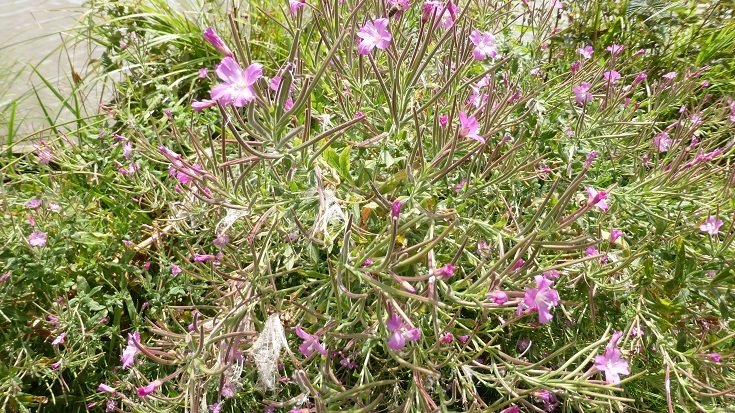 It must have been a combination of high current (the recent hot weather – lots of sun) and high temperatures (ditto)! Once this had been bypassed, all was well and the controller burst back into life. Meanwhile, Sunday was very very very wet but the clouds parted and it dried up for the latter part of the day and so we headed off to StokeFest – a music festival. 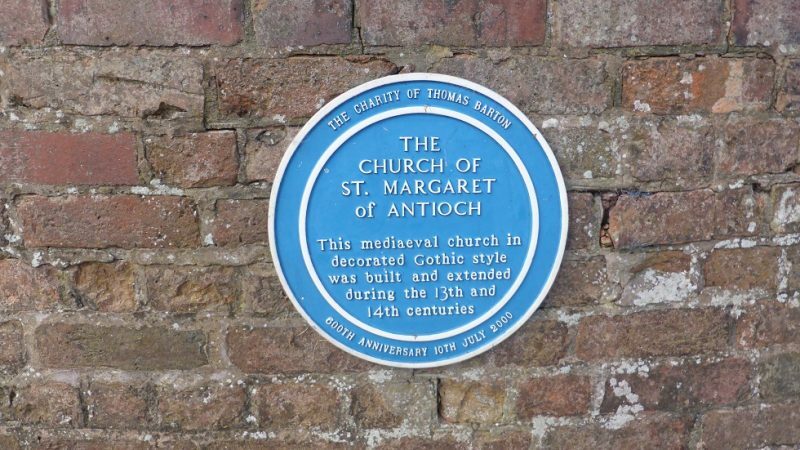 Oh and on the way, two more blue plaques! What did we find? A big trailer with kids playing stuff and a field, sporadically filled with folk. 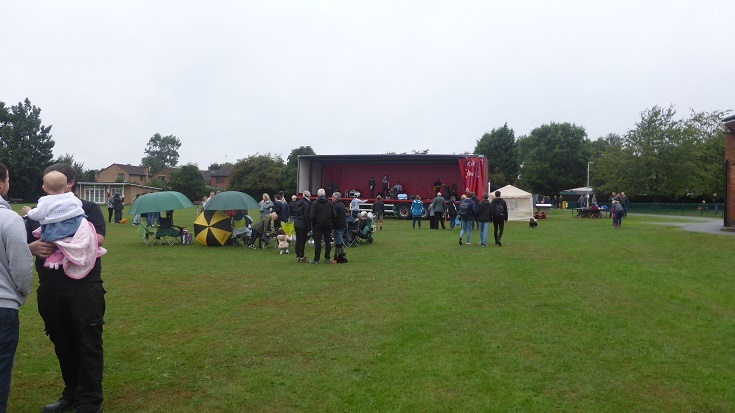 Thankfully, with the rain holding off, more people turned up and it looked like it was all keyed up for “kicking off” . 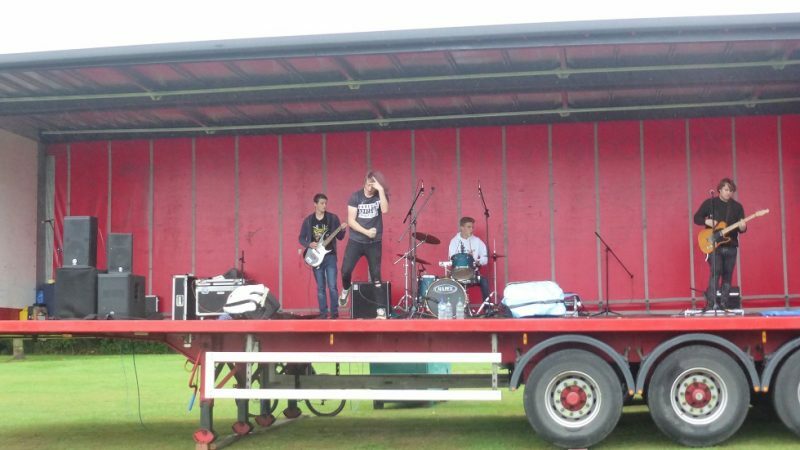 . .
Not sure of the band but they did do a pretty fair rendition of “Mr Brightside” so fair play to em. 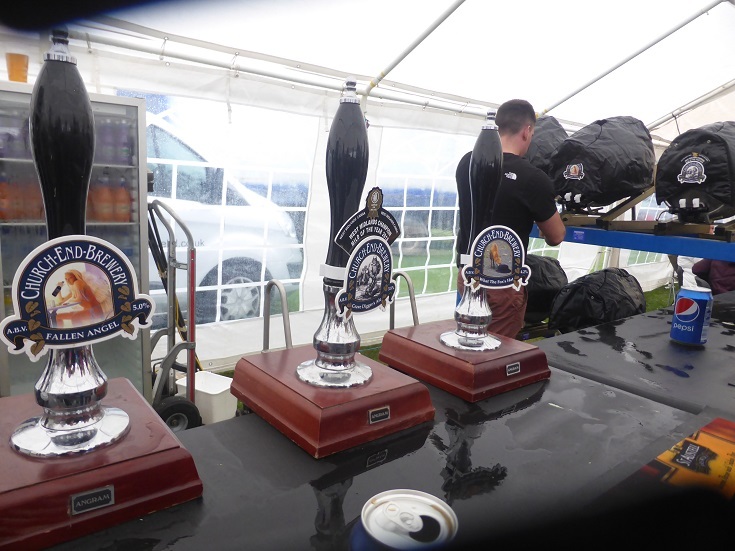 Meanwhile, Steve had discovered the beer tent . 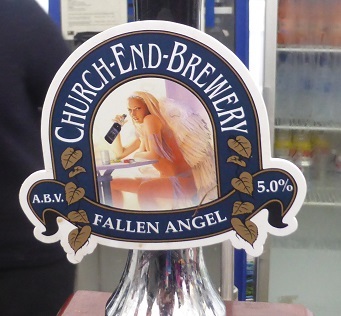 . .
An excellent beer and at £3 a pint, mustn’t grumble! Viv’s favourite! And is that her posing ?? 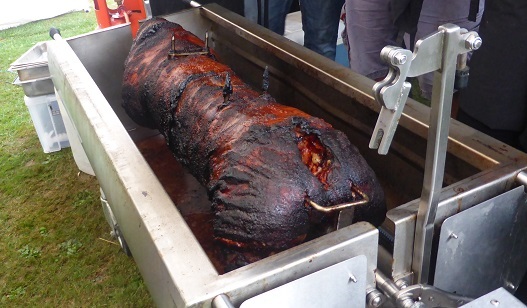 Sorry Gail, but here’s a very non-veggie pic of a whole pig! The crackling was marvellous but we didn’t buy any, it was time to head for home and leave the kids to it. Next day. Fuse problem solved. 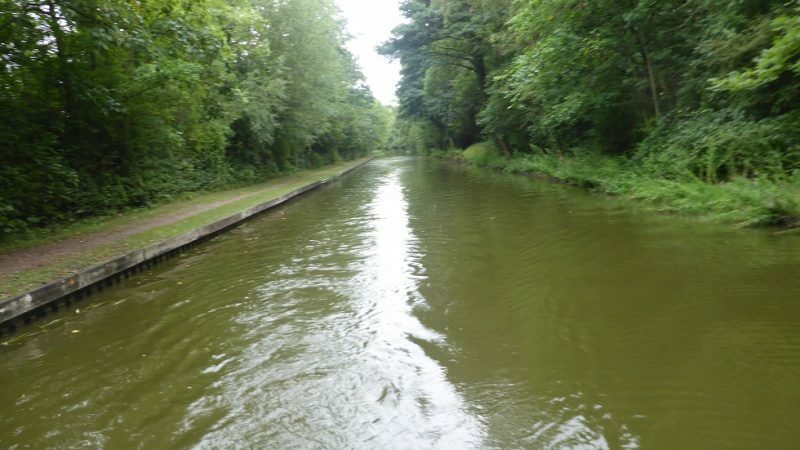 We refuelled at the Ashby Boat Co. and took on water etc Then the engine misbehaved. Causing Steve to utter expletives but to gradually reverse back to the boat yard . 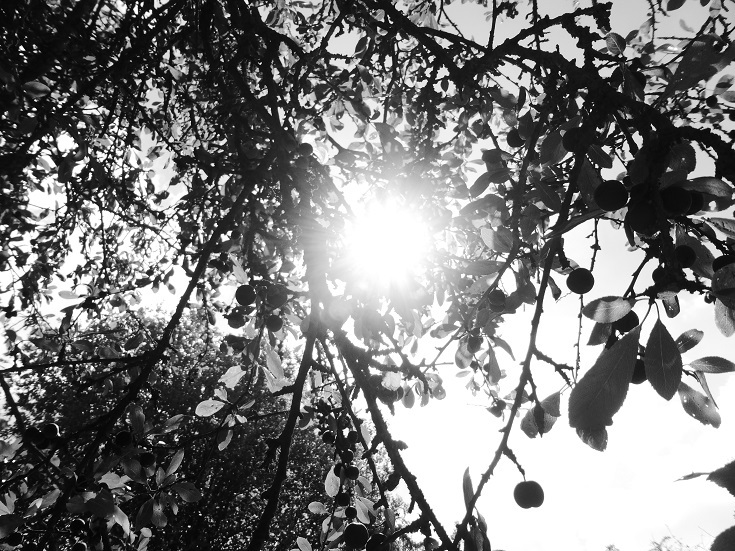 . . he had previously undone the agglomerator (lovely word – look it up) and we reckon, with hindsight, that he hadn’t quite tightened it enough, allowing air to ingress. Engine no like air – want diesel. OK lesson learned. 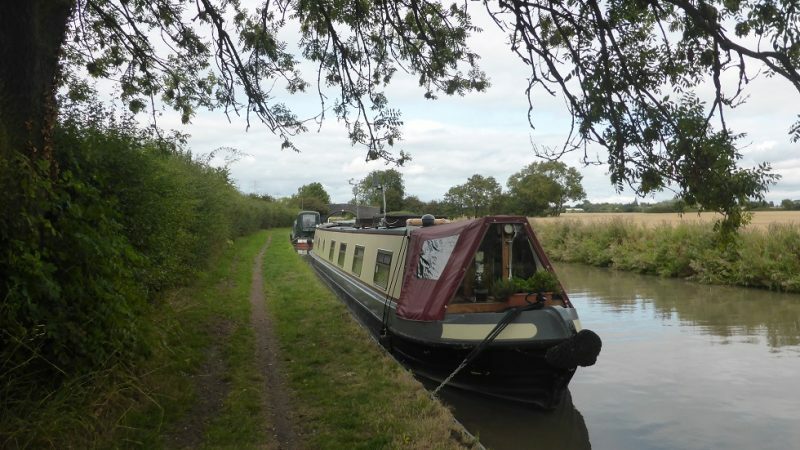 Great most problems solved we moored just a mile or so further on near to Hinckley. Gluttons for punishment, we then set off for Hinckley, just the 2 miles there and back, to pick up dog treats (previously ordered online) plus a wee Tesco shop too. 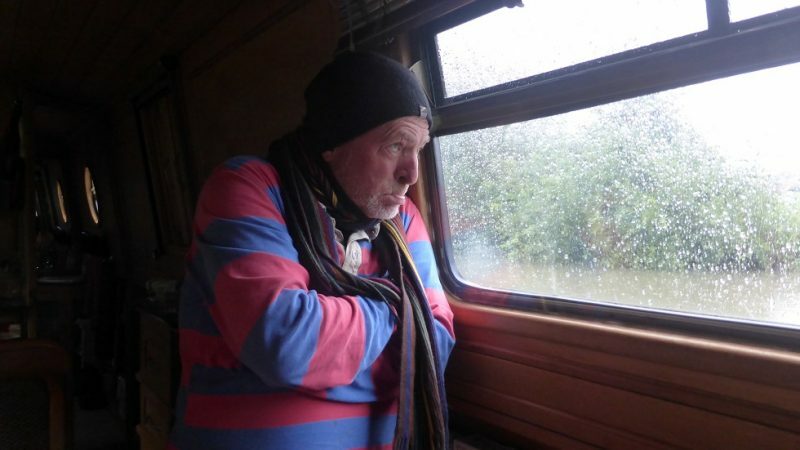 By the time we had got back – many hours later and two rather necessary showers . . . we were in need of some refreshment/nerve restorer. 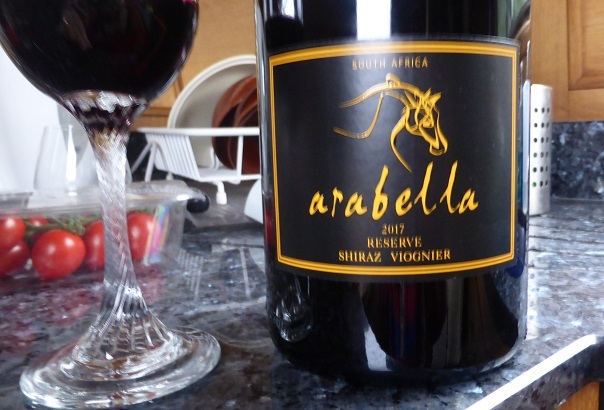 Sorry, Jenny but your promised magnum of Arabella, Shiraz Viognier has to be opened!! Needs must and I must obey the Admiral (aka Er Indoors)’s instructions! And very nice it is too . . .. . .ZZzzzzzzz . .. 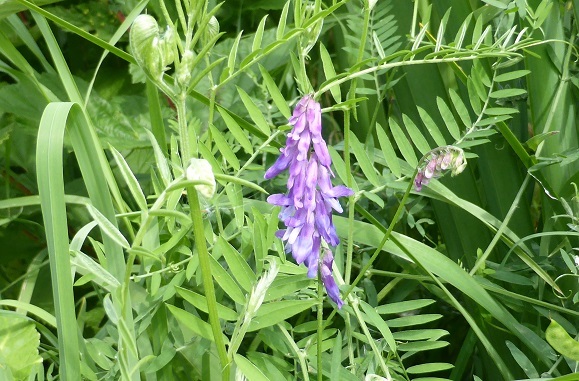 Flowers, Beer, Upset & Rain – well it is a Bank Holiday! 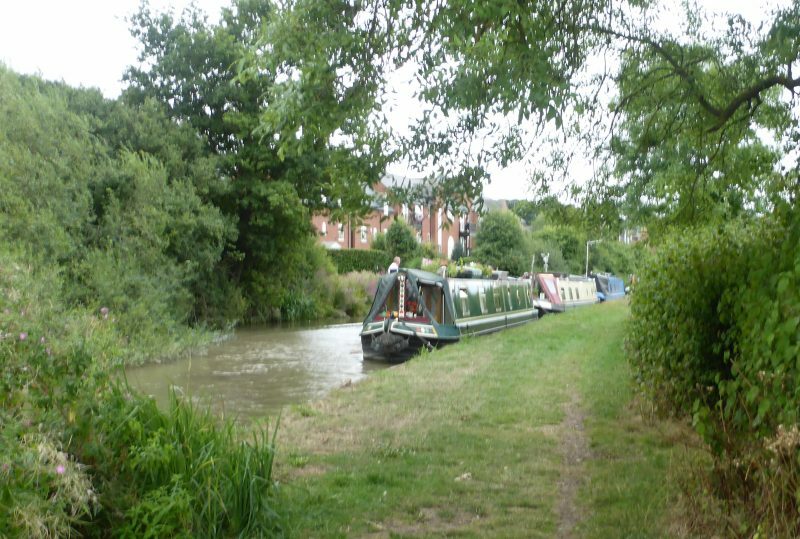 It really is a lovely spot Stoke Golding and not just for the George & Dragon. 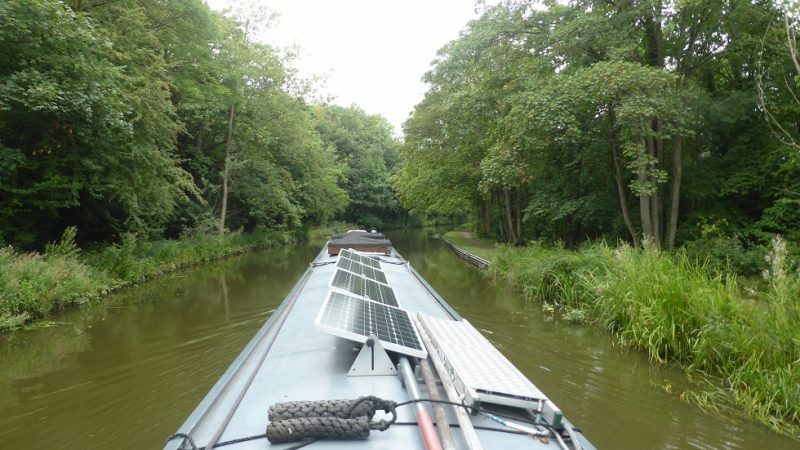 We’ve met some nice boaters, walked into Dadlington, visited a flower festival, rewired the new battery monitor so it works properly and found out that the solar controller is not working – not a big deal today, as it’s raining cats and dogs! 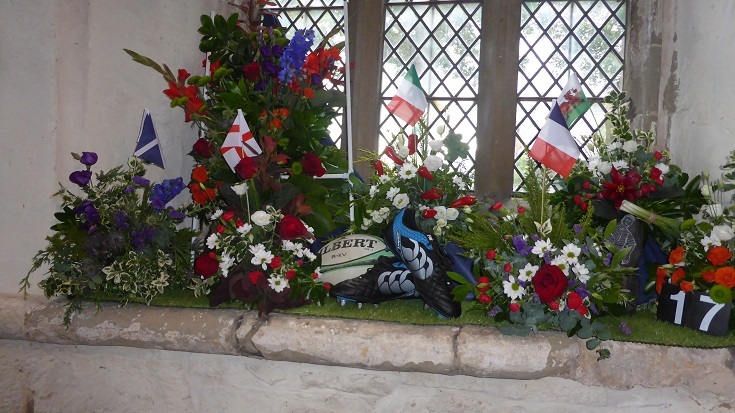 A shame because the flower festival is still going on, as is the StokeFest – an outdoor music festival! 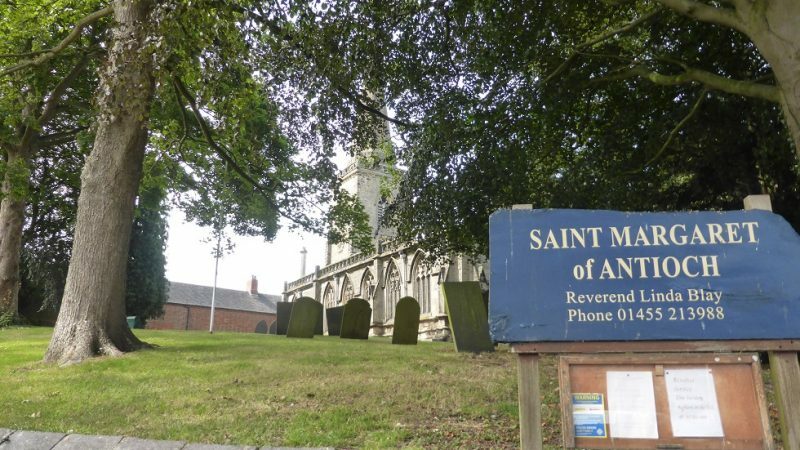 Here’s our spot for the week – with St Margaret of Antioch in the background. 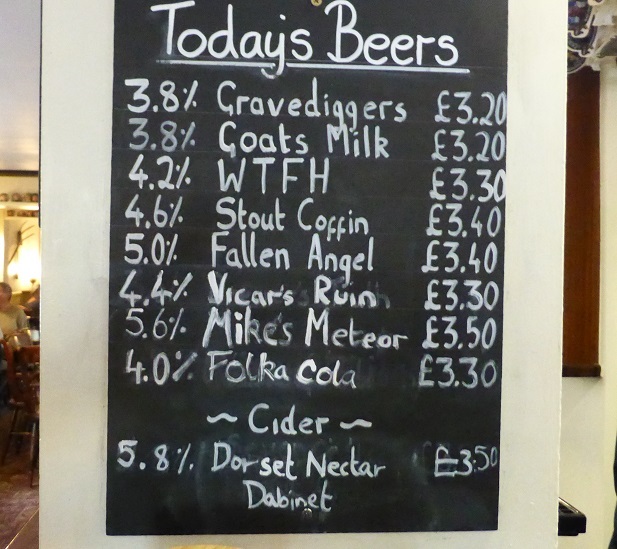 Back to the magic bar in the George – more Fallen Angel, Stout Coffin, Folka Cola and some of those huge sausage rolls . . . and roll back down the hill we did! 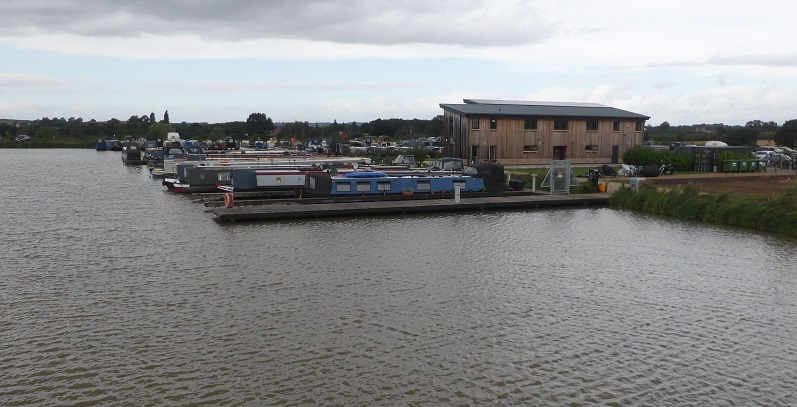 We also looked in on the Ashby Boat Company – a boat hire base but so much more – a small chandlery, shop and boat yard. 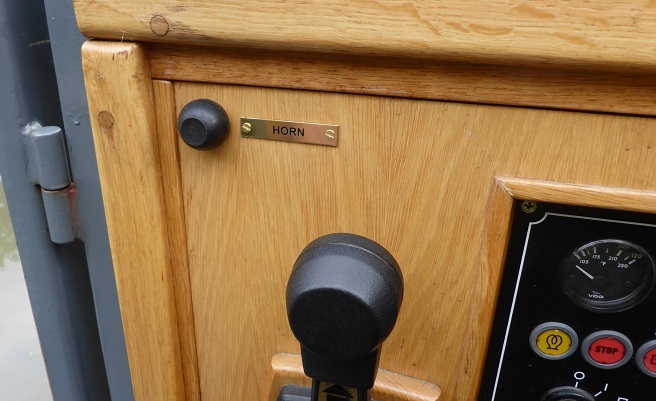 Steve even managed to find a brass name plaque for his new horn button plus some ice creams! 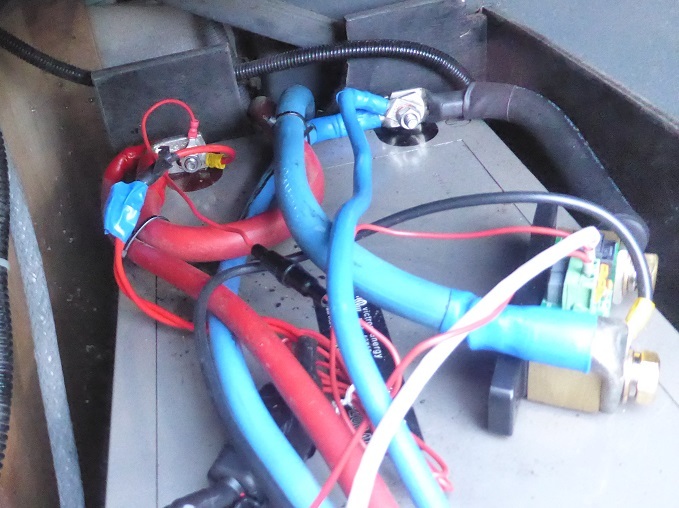 Hmm, more problems with batteries – seems Mr C has wired up the new monitor wrongly, allowing the current from 2 of the 3 batteries to bypass the meter! He was wondering where the amps were going!? All changed now. 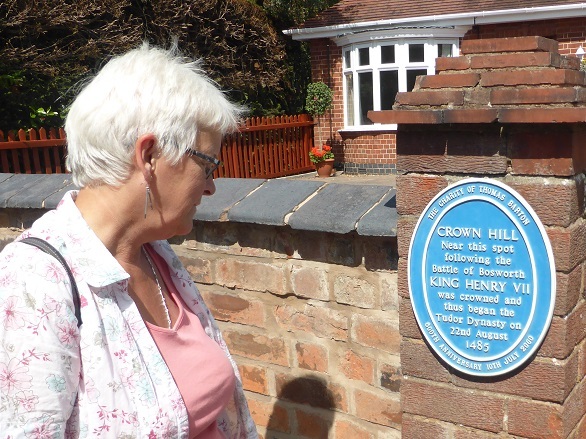 Through the hedge and into the small village – no blue plaques but awfully quaint. 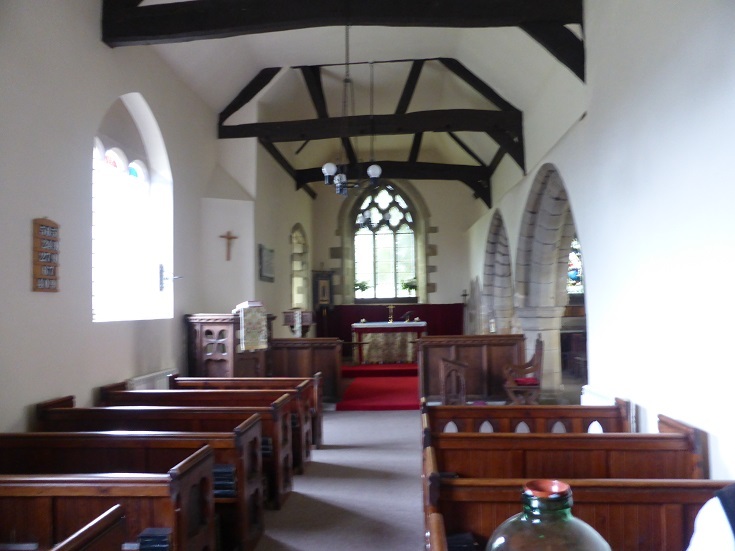 Here’s the inside of St James the Greater – famous for being the nearest church to the battlefields of Bosworth and probably where quite a few of the soldiers where buried. 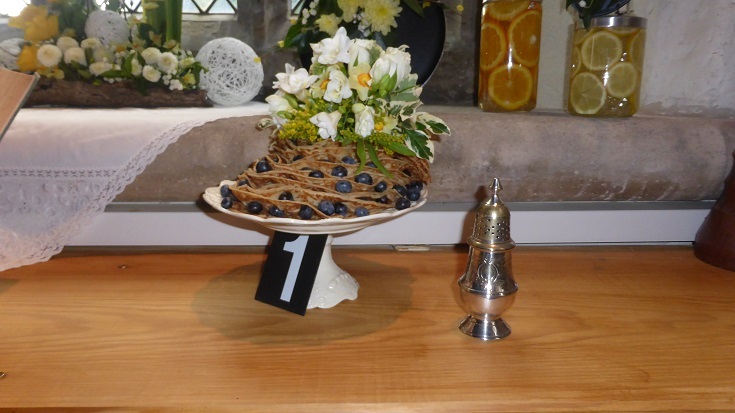 And on to the flower show in the St Margaret’s church, Stoke Golding. 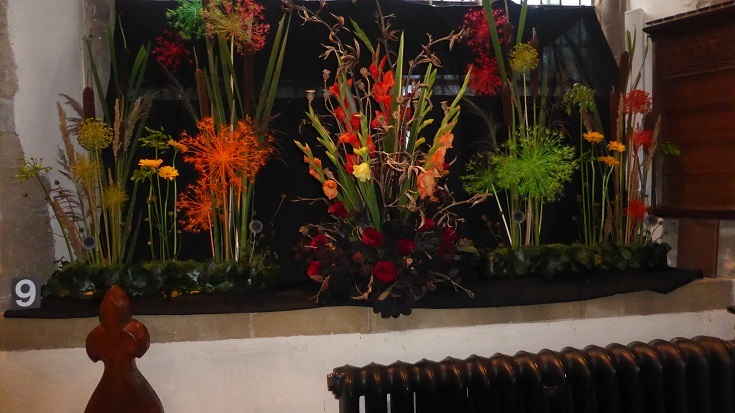 All the displays were themed – see note below – very pretty & expertly presented too. 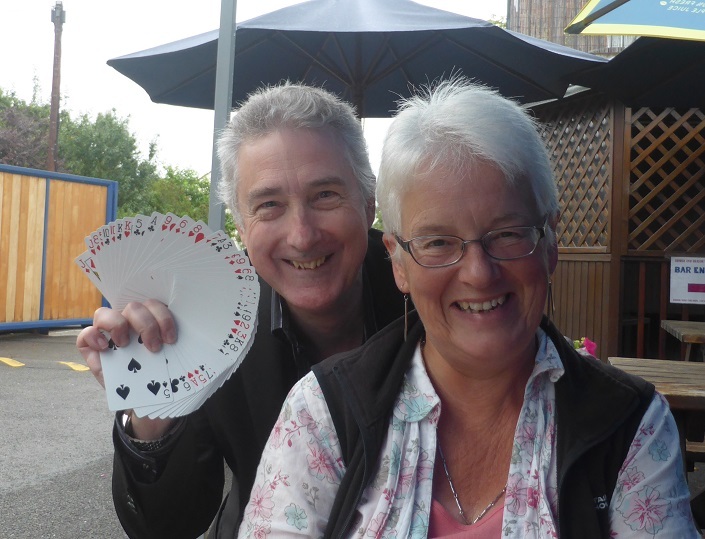 Met some nice folk today – Steve, ex RN chef on his boat Chloe, who popped round for tea and a couple in the George, who shared a table and lots of yarns too. Very busy for a Saturday lunchtime but then it was Bank Holiday weekend and I’m guessing a lot of the folk had seen what was coming Sunday! Sunday loomed and Steve got the glumps. Doubly so, for on our return from the village, the solar controller had thrown a wobbly and refused to play. This meant no power coming into the boat and having to run the engine for a few hours. The rain, well, stair rods is the expression and it truly did. And it was cold!! First time for about 3 months!! No, we won’t put the fire on. Couldn’t work on the poorly solar controller because it means being out on deck . . . tooooo wet. Glum. Glum. Glum. Not to worry – tomorrow is another day! And drier. 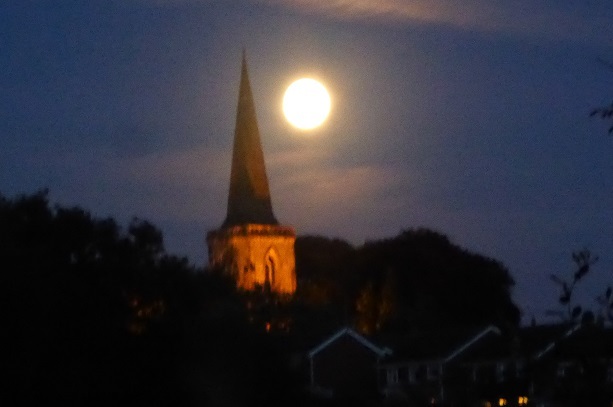 Oh and we had a curry – found out that you can order online from the Mango Tree (almost nextdoor to the George) AND they would deliver – so we gave them an address next to canal and waited and lo, it arrived – jolly good it was too. 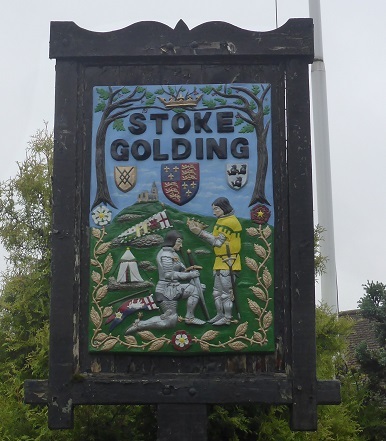 Another asset of Stoke Golding . . .
With a bit of too much time on Steve’s hands . . . . he made this! 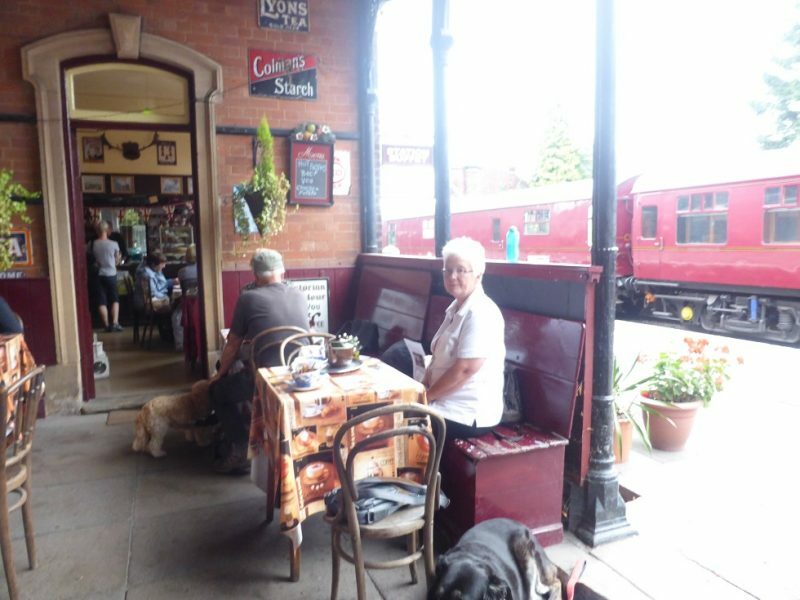 Sunday now and so we head back down the Ashby – Steve wanted to surprise Viv by stopping at Shackerstone, to visit the heritage railway station and the lovely Victorian tea rooms. We also met up with Linda again, as she was on to her third batch of family visitors! It was a lovely cruise and so was the lunchtime stop. A pot of tea and ham & cheese toasties. No steam trains today as the loco was unwell (that was the official reason given) . We had to buy a platform ticket, very quaint. 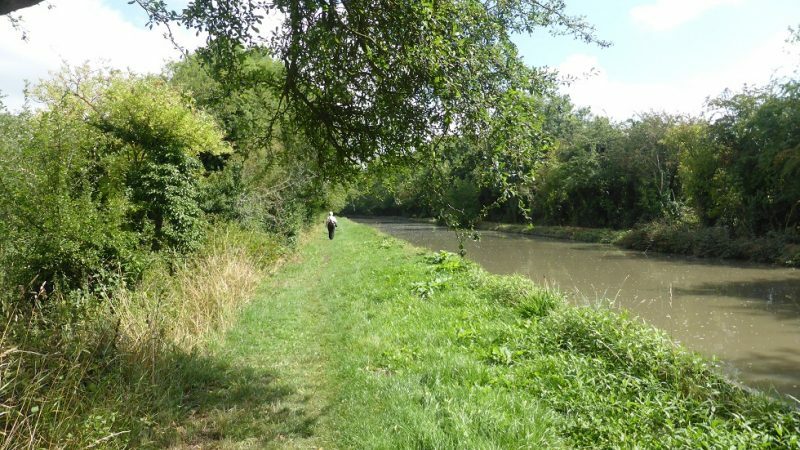 Then after lunch we chugged on to Sutton Cheney – a nice run to get those batteries charged plus a good point for water and those very spotless showers. 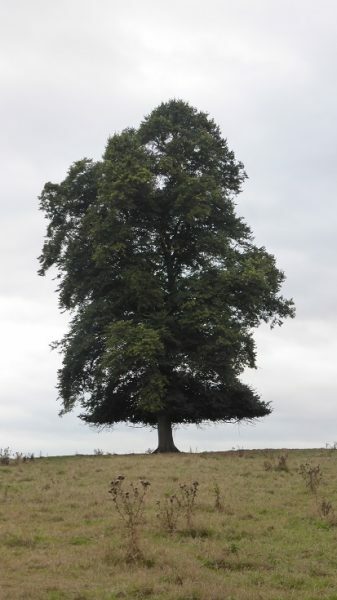 A candidate for the tree of the month? Strange little brick built harbour – belongs to the “hice” (house) above. Oh no, it’s that tunnel again. 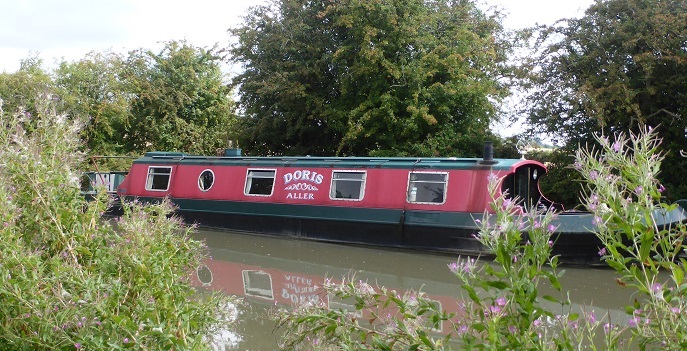 A Muppet on the towpath seemed to be saying there’s a boat coming – oh, oh another purple alert? False alarm as he meant he saw one going in! A two-seater kayak (is that the right term) and unusual sight, I give way, slightly. 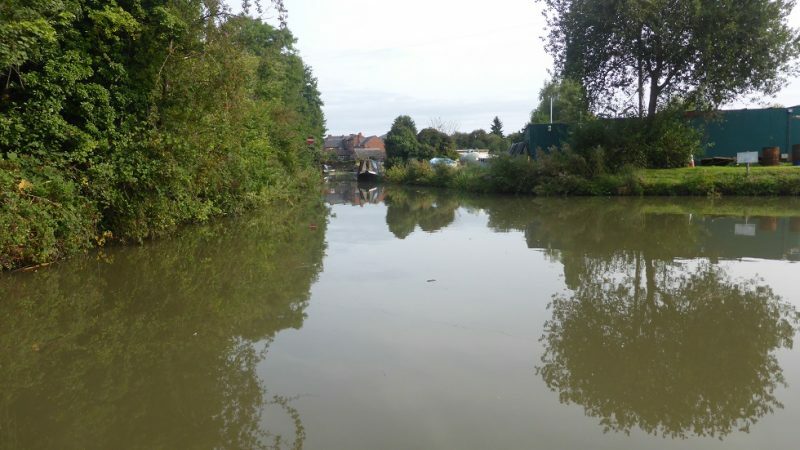 One has to focus even more carefully on this canal, for it is a shallow, just a yard off centre and you could be aground. 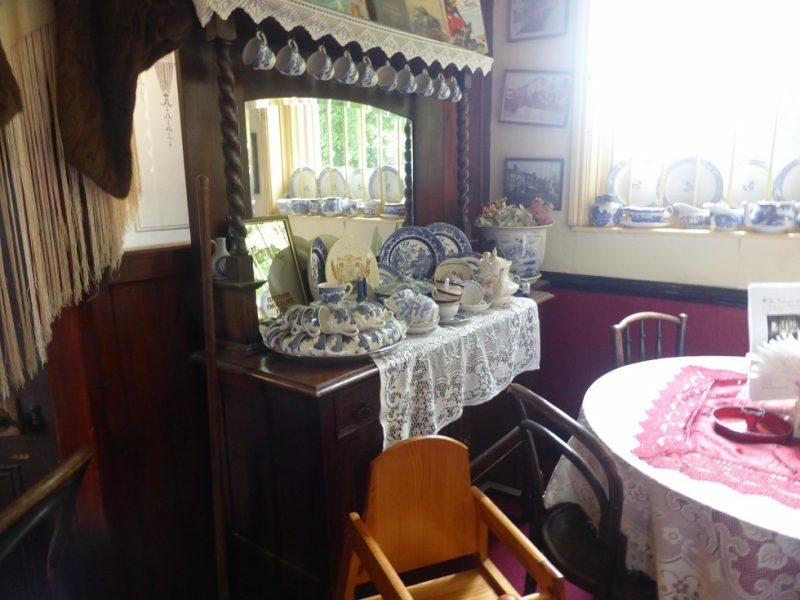 In the station at Shackerstone (see blogs passim for piccies of actual steam trains), there’s a couple of rooms set aside for museums – train stuff and WW2 stuff too. Meanwhile we sit and wait for our grub. The “tea for two” was a giant and very heavy teapot. Obviously designed to be poured by the butler. 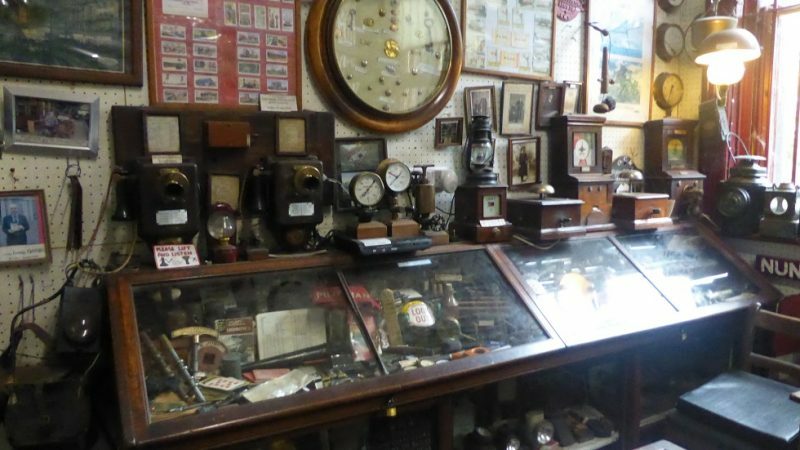 They had some rooms inside – all decked out with excellent Victorian memorabilia. This dresser had a huge tea service. 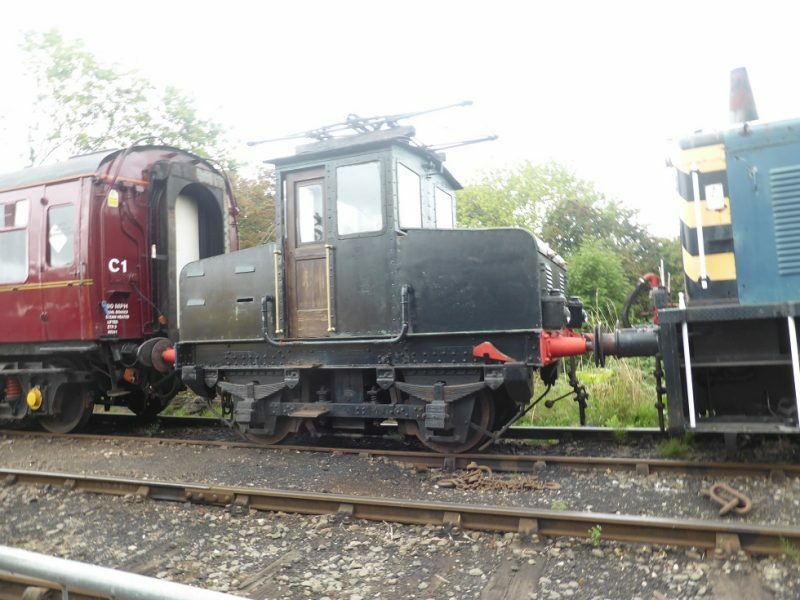 Only a diesel service running today. There were quite a few odd engines around – including this one? Foreign? 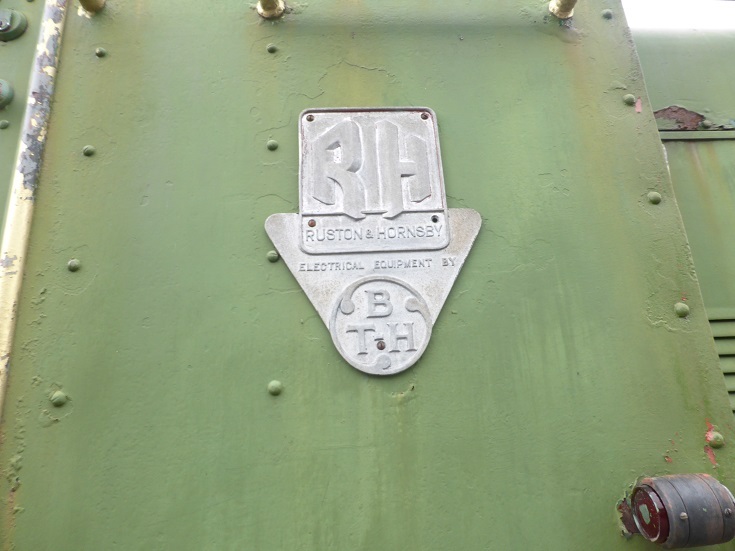 Our chum, Simon on Empress has an RH engine on his boat! 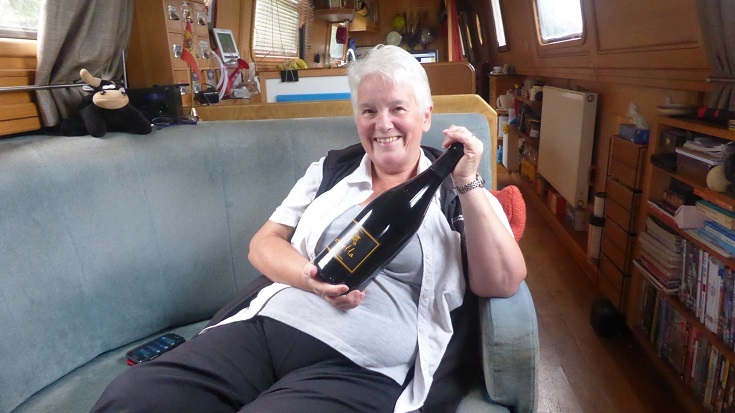 Goodbye to Linda & Mollie – busy cleaning the boat before the next batch of visitors arrive. 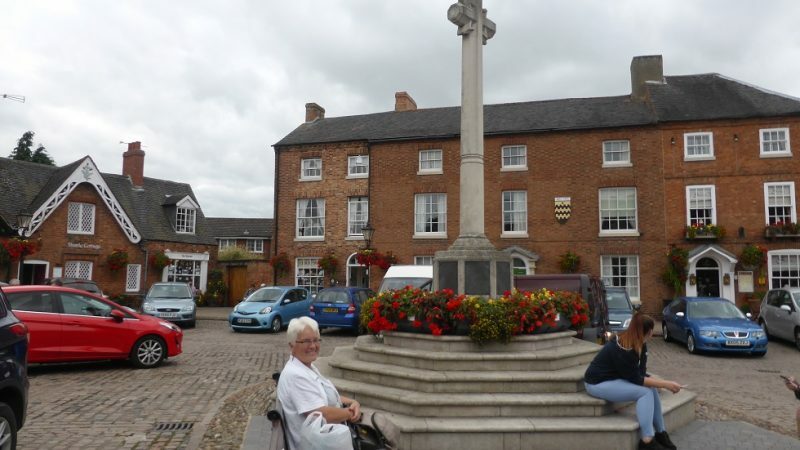 As we passed through Market Bosworth, we saw the artist from Laura, busy doing a commission – a pet dog portrait! 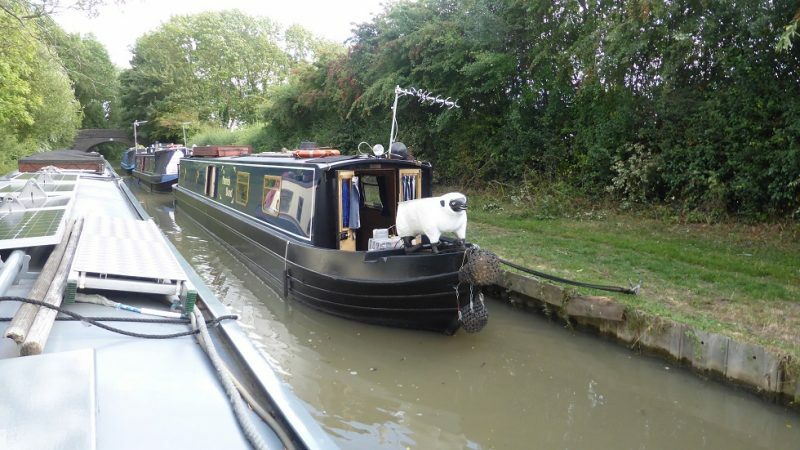 Further along, we espied that sheep on the front of a boat – seems familiar? 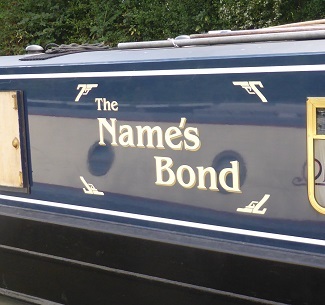 Yes, it’s a Welsh chap, called Neville Bond and his boat’s name? 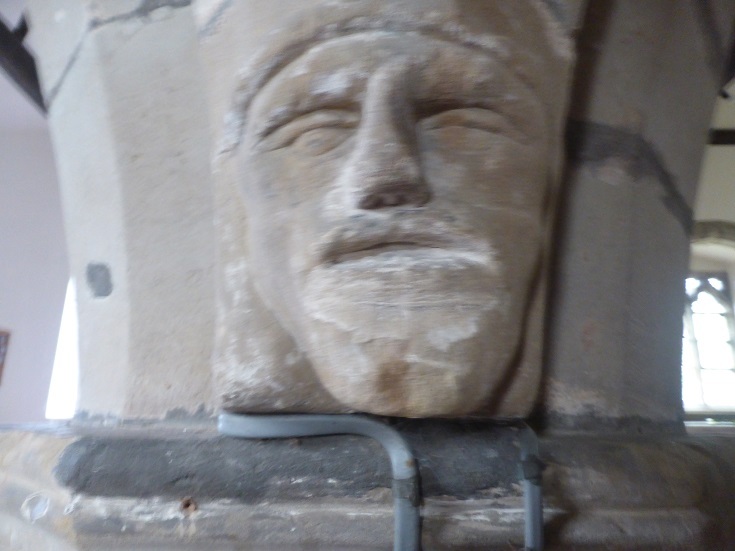 We met him last year on our trip to Chester. Poor Toby! That look! “Make it stop!”, “Are we there yet? ?” And very soon we were. 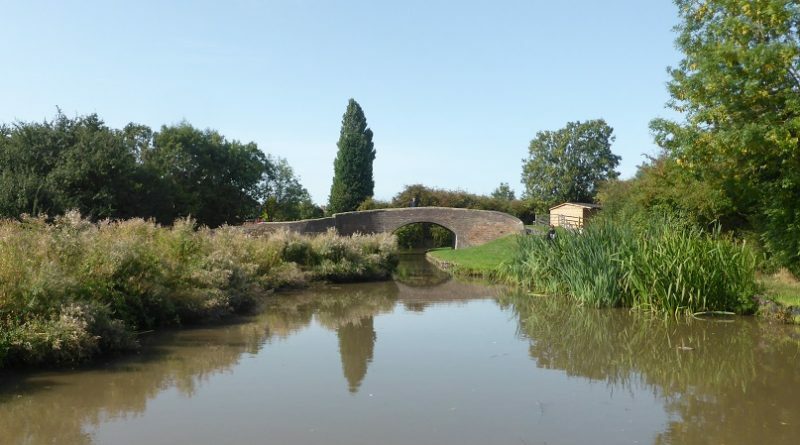 Sutton Cheney wharf – time for some more of that lamb and perhaps a glass of port & a cigar. A long day. 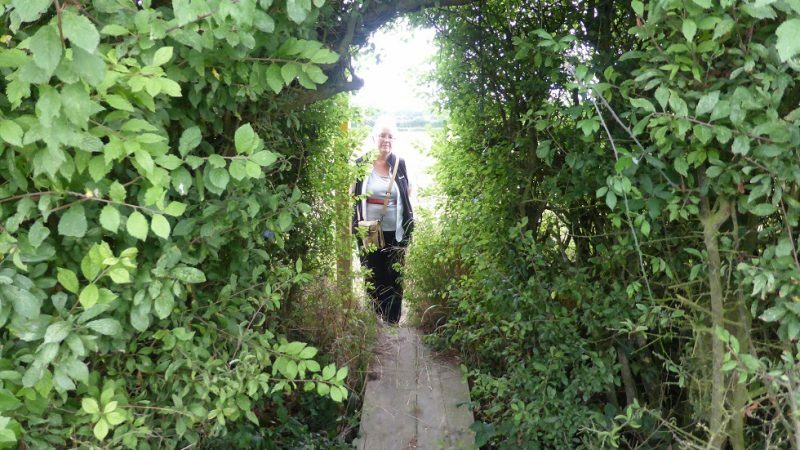 Beyond Bridge 61A – the end as we know it. Awoke to a weird bleeping noise. Not heard that before. 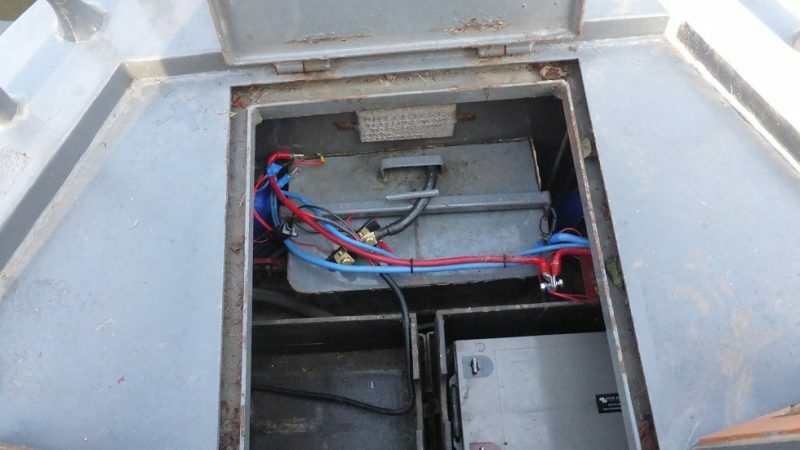 It was the newly installed Victron BMV-712 – the battery monitor. The battery voltage had reached 12.2volts or 50%! Alarum! Alarum! Go to Purple Alert! To be honest and fair, we have been using the leisure batteries a good deal (two nights running we watched films via the Blu-Ray player, TV and sound bar) plus it hasn’t been that sunny. An initial panic but we did plan to set off today anyway – we have a large lamb shank to cook in the slo-pot. So, ideally a 5 hour cruise would be needed – to properly cook it and to recharge the batteries. This would mean heading straight to the end, without stopping at Shackerstone. Onwards! 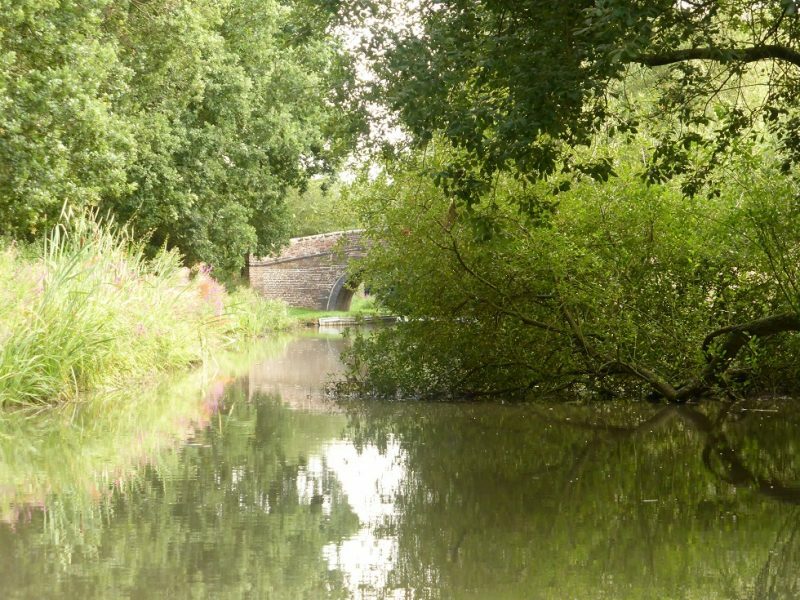 Beyond Shackerstone, it gets a bit wider and very pretty – this is near what was Gopsall Hall – famous country seat where Prince Edward VII came by train to Shackerstone and then by carriage to the Hall. Handel also stayed here and is supposed to have written the Messiah here. All demolished now. 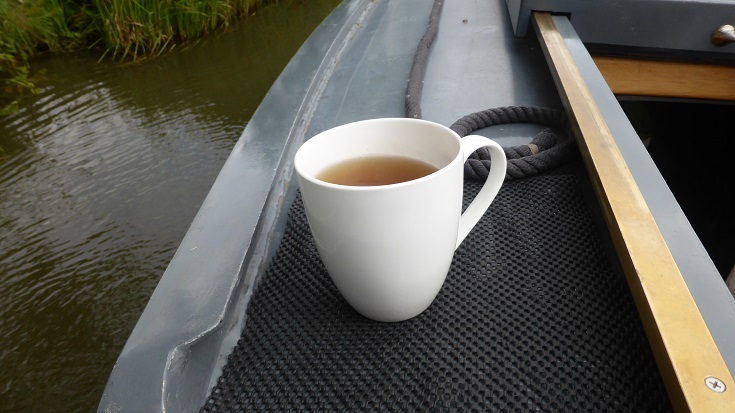 Just to show folks that the helmsman does get a tea supply on a regular basis. Looking more and more like the Enchanted Forest. It all seems very isolated and lovely. 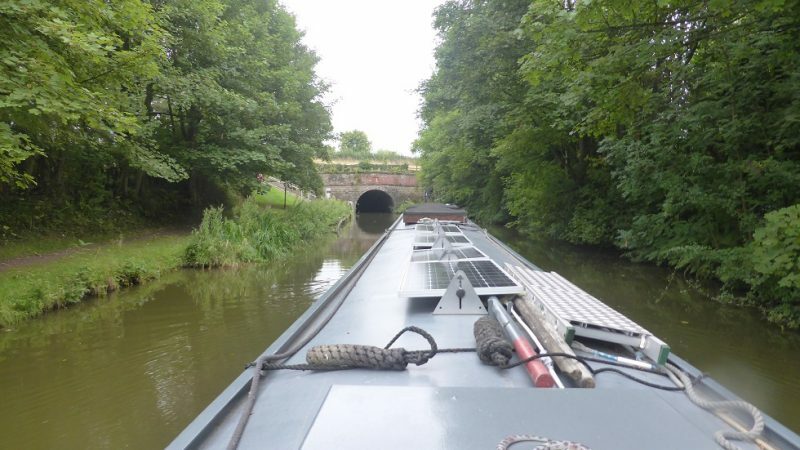 At Snarestone we meet the one and only tunnel on this canal. A nasty piece of work as it can only take one boat, so you have to check it’s clear and then it kinks a bit and then gets lower! A great chance to bash bits of the boat. So slowly and carefully we chugged through. Could this be the last bridge? Bridge 61? 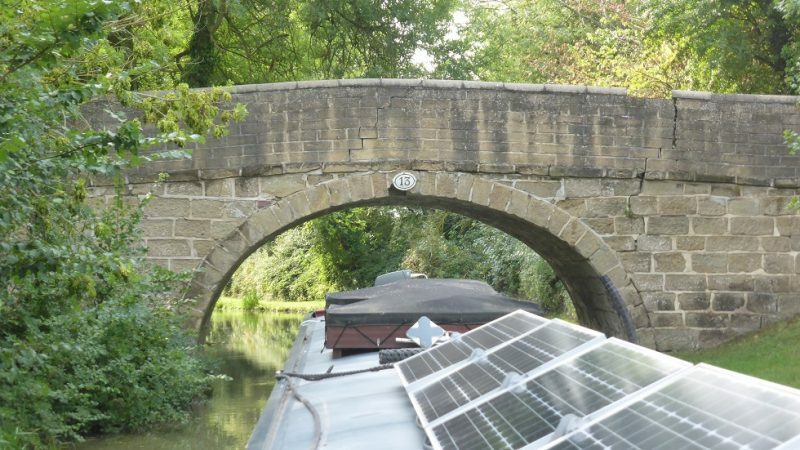 A typical Ashby stone bridge and a turnover one at that. 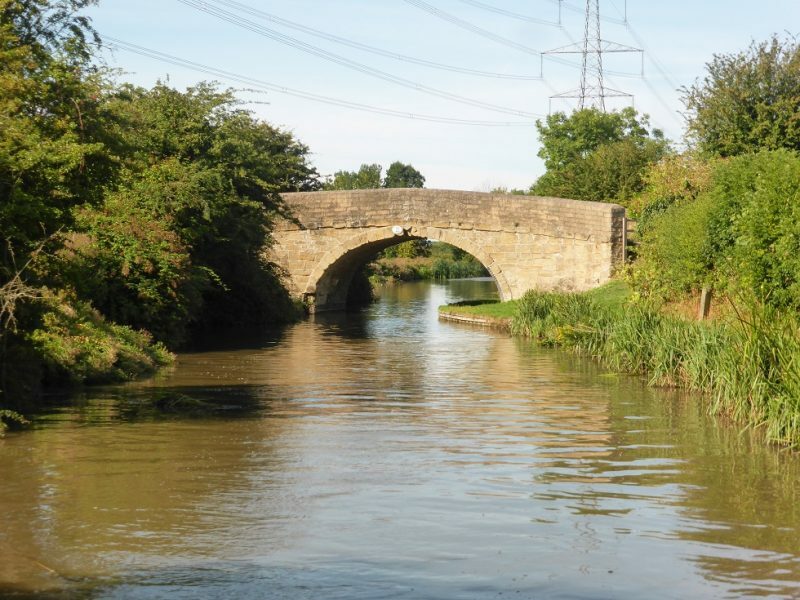 Here, the horse would cross the bridge from the right to left, turning around and then under the bridge – ceasing the need to uncouple said horse. The terminus is an odd affair. 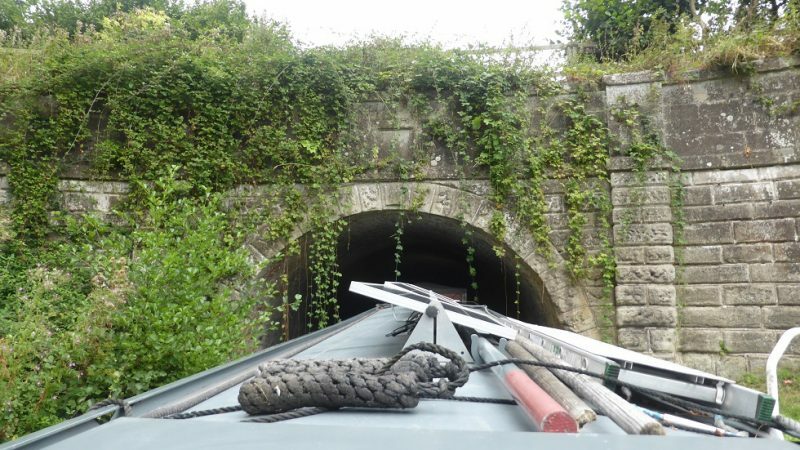 A huge winding hole, so you can turn the boat around. 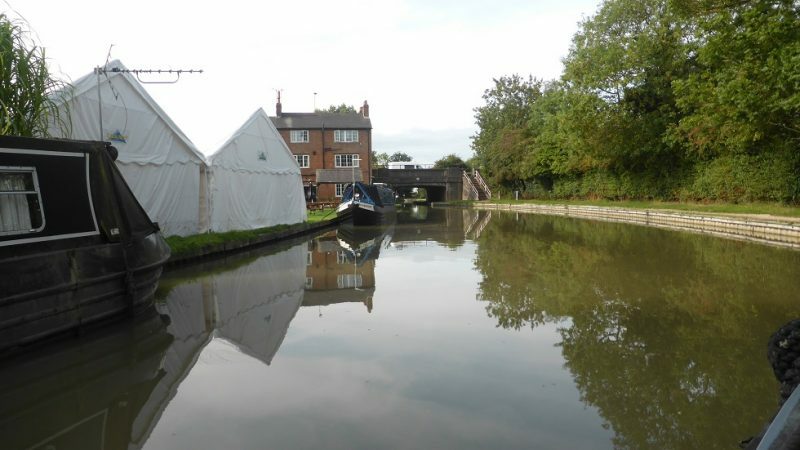 Plus there’s a facility point for boats (left) and a bric-a-brac shop with the Ashby Canal Association hut on the right. We bought a few bits and pieces as well as donating some videos (thanks Mark) and a book. 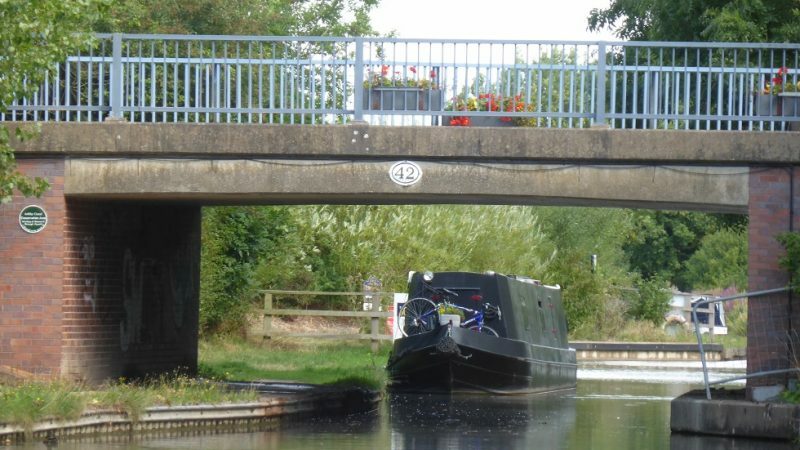 We then reversed thru the swing bridge (61A) to a small 48 hour mooring. 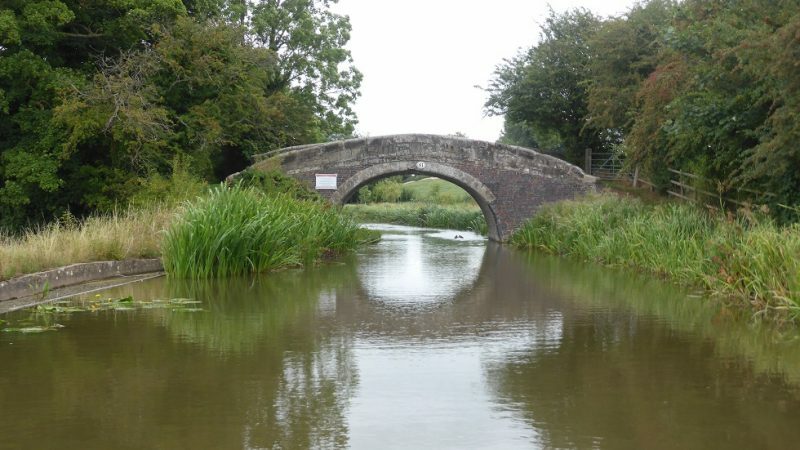 Now on the Ashby Canal Assoc. water and not CRT! This will do us for a day or two. Lamb all cooked. 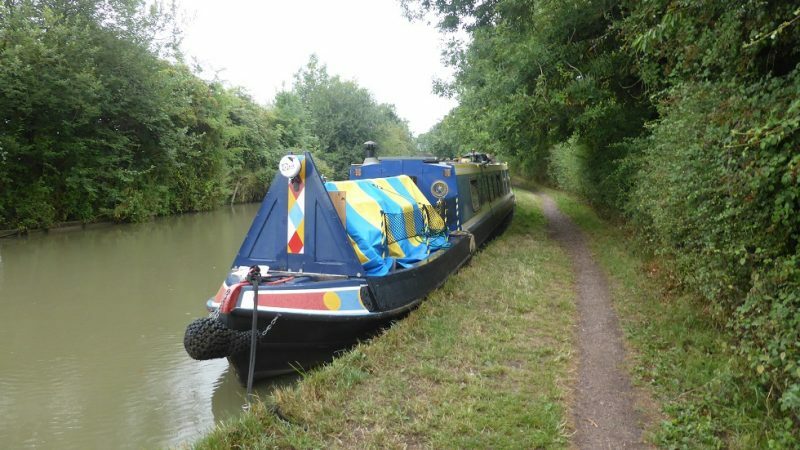 Feels kind of snug & secure back at this mooring. 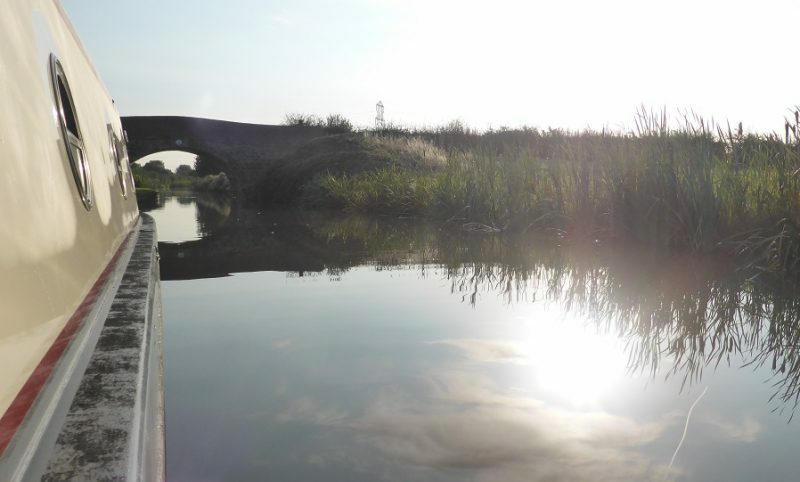 Steve cycled on to find the lost bit of canal for it used to go on for a further 8 miles through Measham and on to Moira. 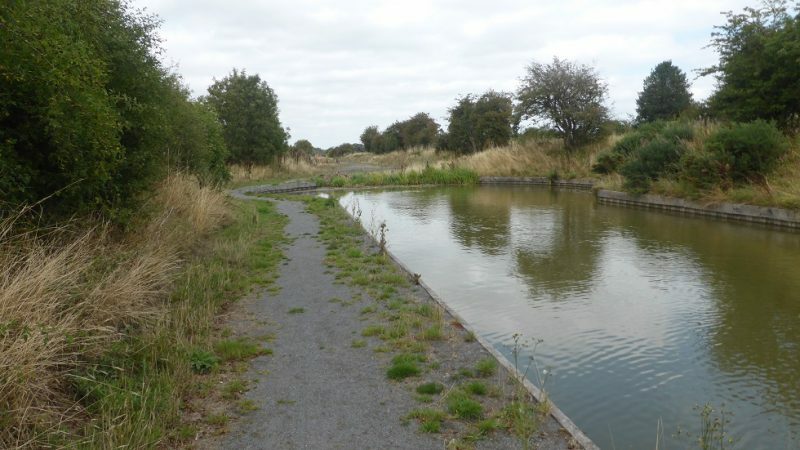 But, all the coal mining which was the canal’s raison d’etre, caused a lot of subsidence and the canal closed. 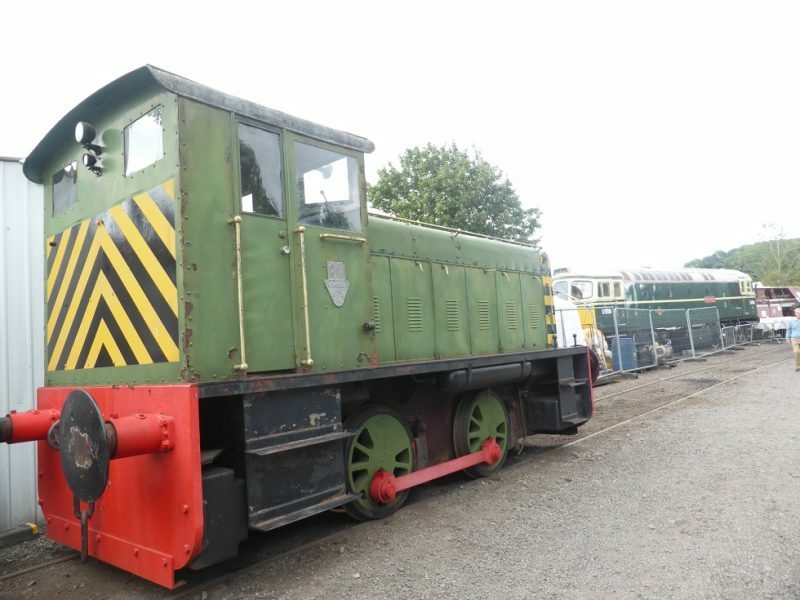 They have restored bits and have plans to restore the whole thing – perhaps not even using the original course but the railway bed instead. This is the actual end – and one reason we swung the boat early as you can only turn a 50 foot boat here. I thought there might be a nice towpath to cycle on but no. It was a very rough track for a bit and then it petered out. I tried to follow it but resorted to going on the roads to Measham. 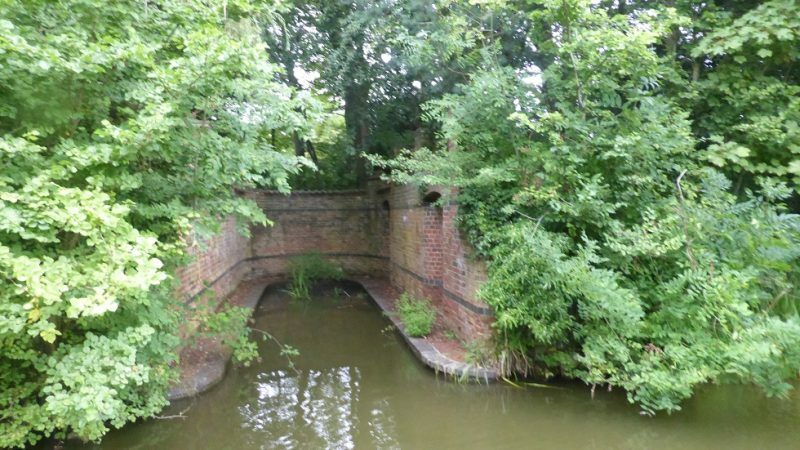 Even here it was hard to find the old canal – there was a Navigation street? 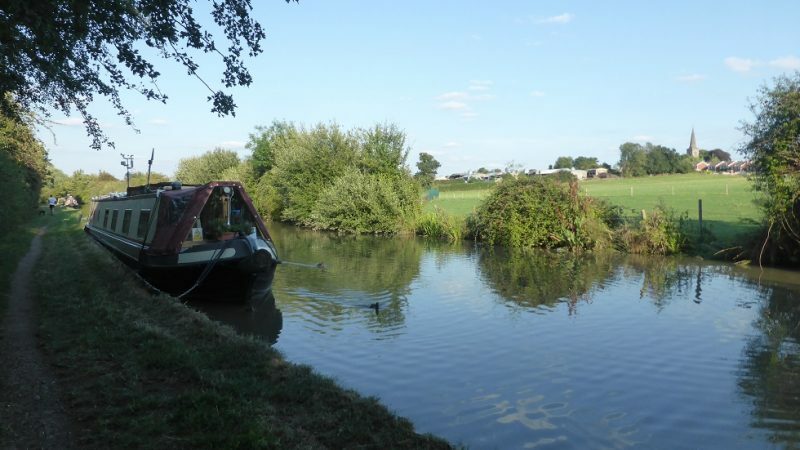 That evening we walked the dog back along the canal to the Globe and sat in the garden . 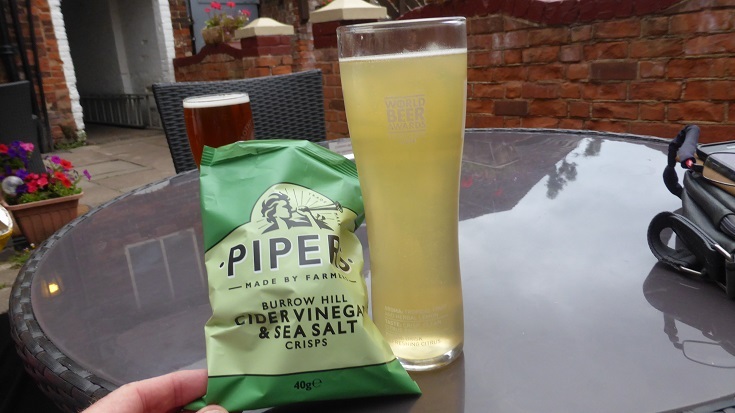 . . drinking Thatcher’s Haze and eating crisps – noting how both came or used ingredients from Somerset! Wednesday – time to move on. 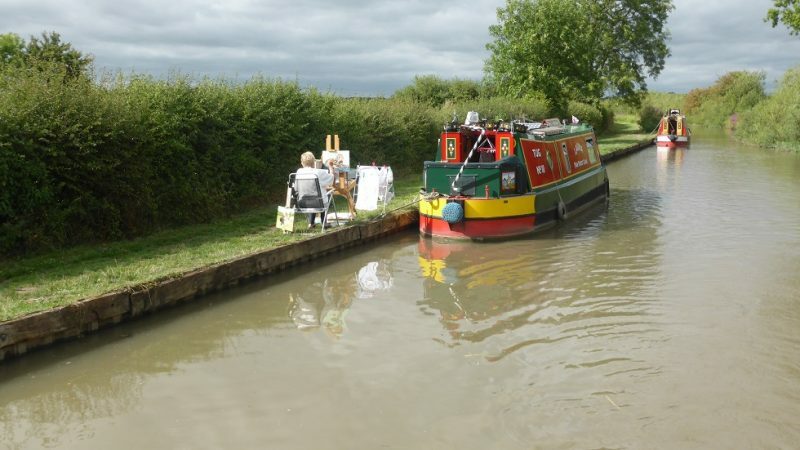 Take on water at Sutton Cheney – had to double up as Muppets insist on mooring at water points! Time for a shower too, as, unusually, these are excellent facilities. Probably more to do with the pricey cafe next door. 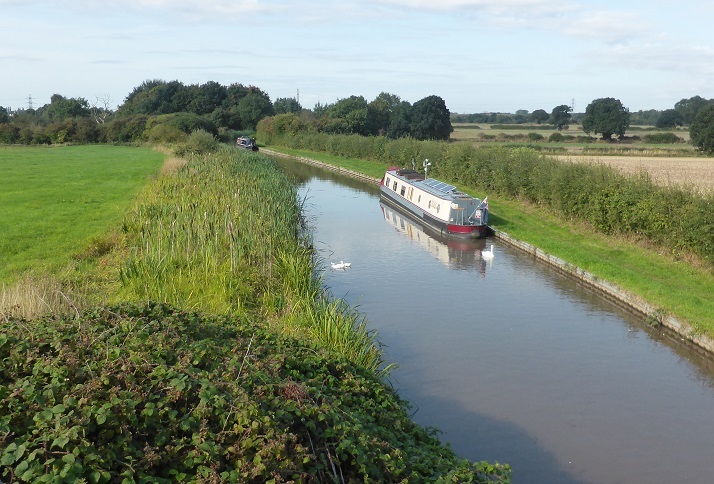 The canal is a bit shallow around here so we chugged slowly on, past Ambion Wood and the battlefield centre, past Shenton – the start of the heritage steam railway line (Shenton-Bosworth-Shackerstone) and on to Market Bosworth. Quite idyllic, rural and peaceful this section. 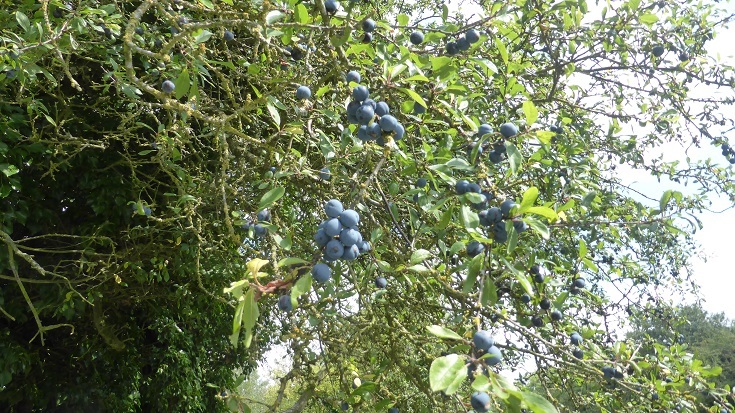 Also in need of tree tidying. We saw water voles last time we were here with John & Christine but, alas none to view today. 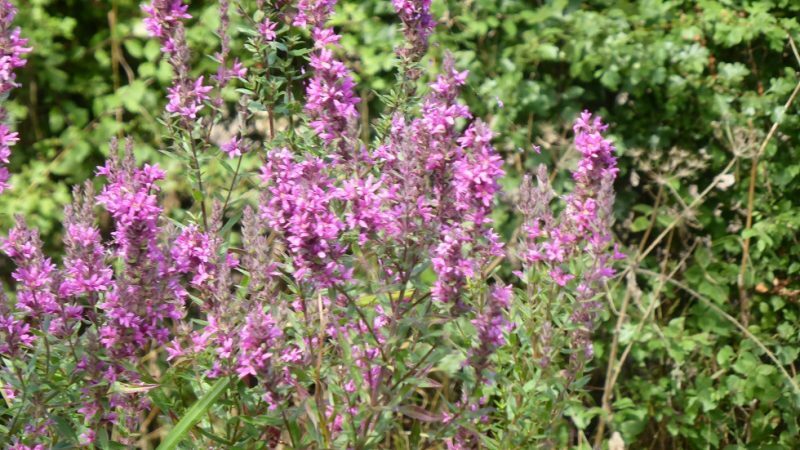 More flora – this time purple loosestrife. Another bridge 42 (for Lucia!) 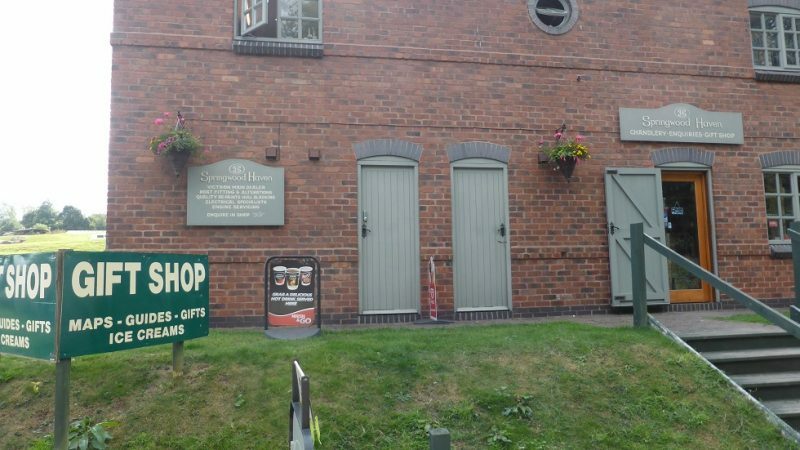 and the entrance to the Market Bosworth marina. Our spot. Not a lot of room here but adequate for the town. 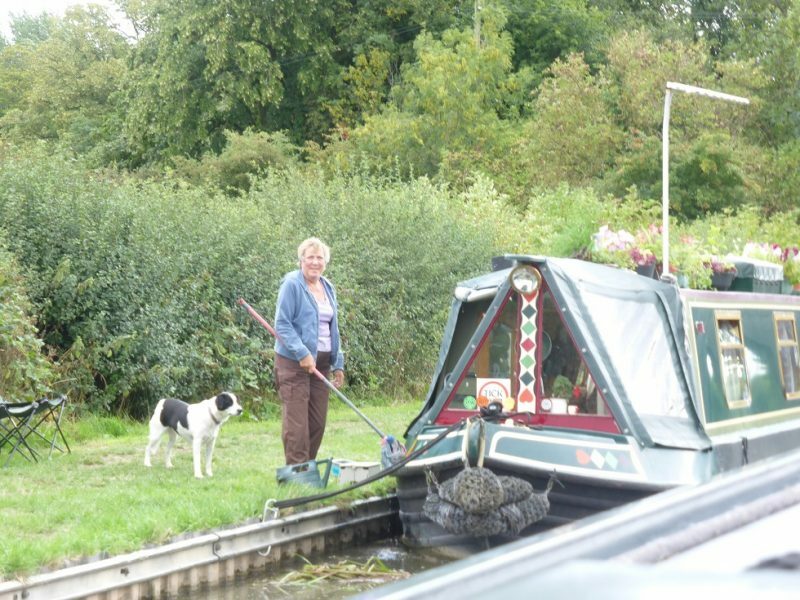 Met a nice single-handed lady(Linda and her dog, Mollie) on Kanbedone II. There’s a slightly longer but much prettier walk into the main town about a mile away, over bridge 43 and over the railway bridge. 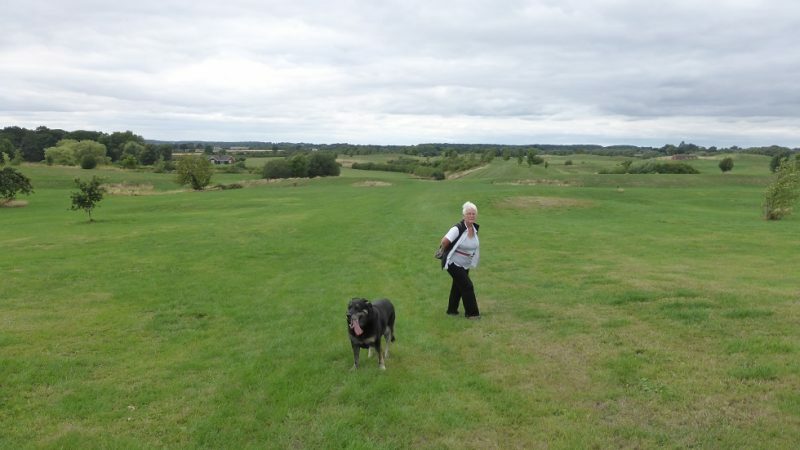 Then across a rather odd site – an unused golf course plus a runway! 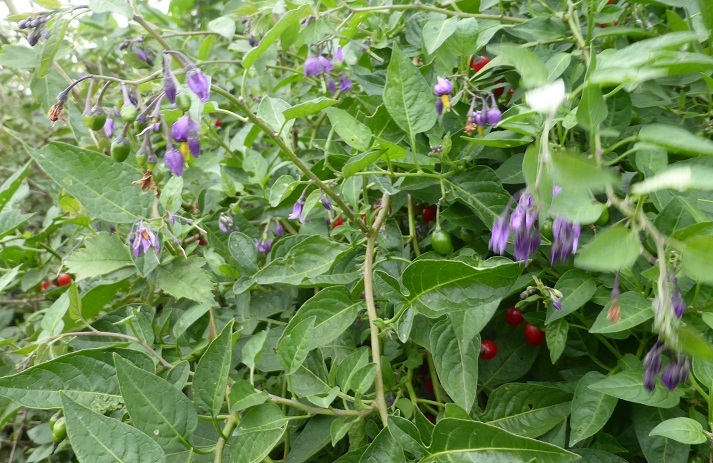 Meanwhile, here’s yet more flora – woody nightshade or bittersweet. 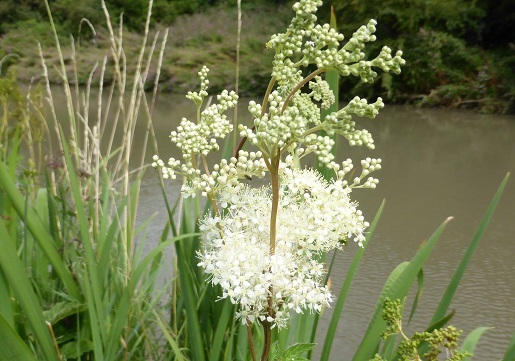 Toxic but not as deadly as the er, deadly sortand the stems were once used in medicine. 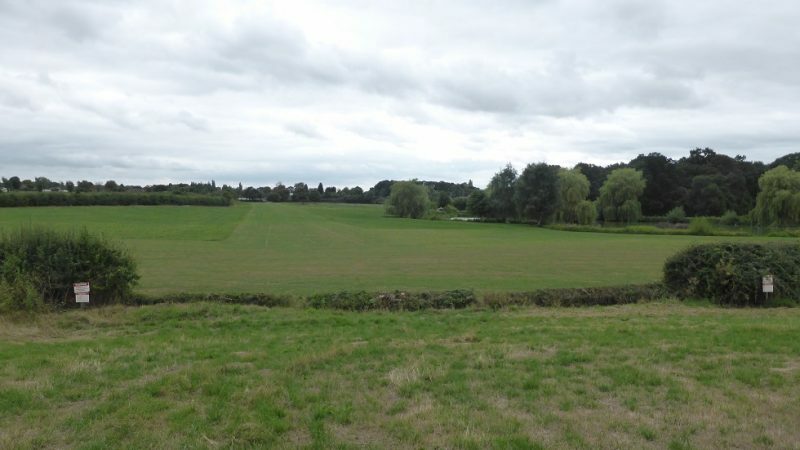 The weird golf course – went bust apparently, and now bought buy the guy in that distant cottage, who also has an aircraft hanger and his own runways. About half an hour bimble into town. 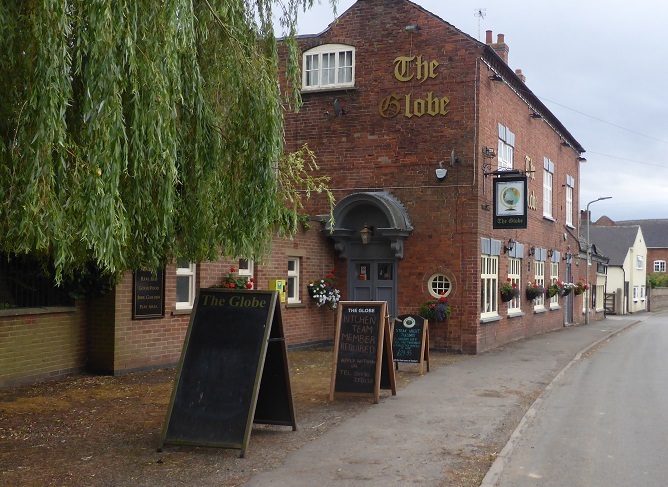 Not a great deal to offer – no post office but a post box and telephone, cash point (HSBC), a few mediocre pubs, excellent butchers, gift shops and a co-op. 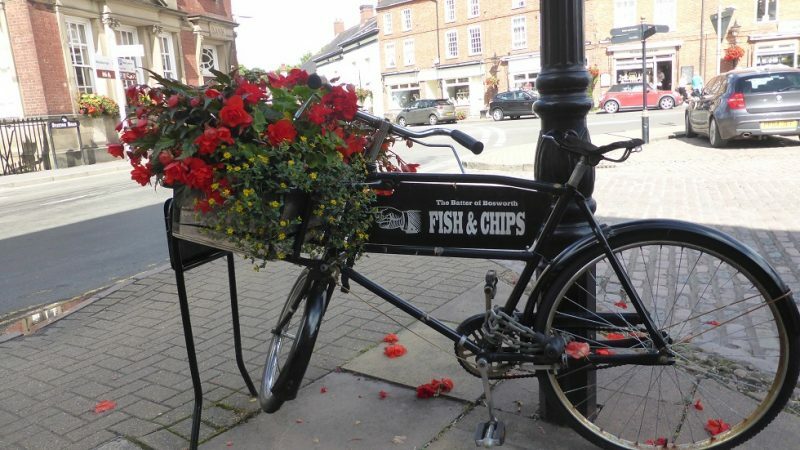 And an example of the smashing flower planting around the town – this one advertising the local chippy “The Batter of Bosworth”, geddit?? Below is a pic of the newish marina. 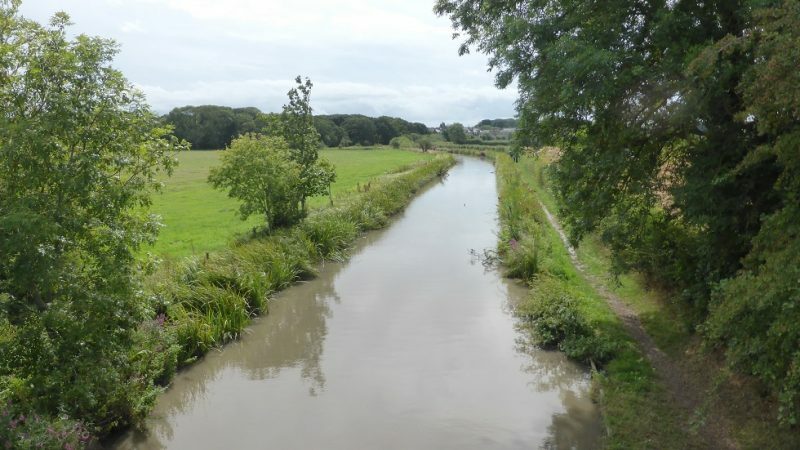 The canal from bridge 43 – our route tomorrow. 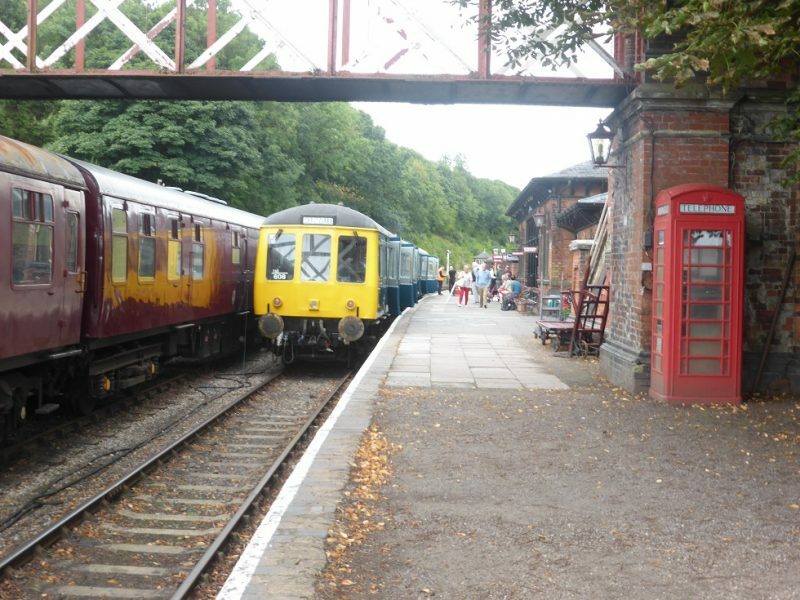 Oh, I did go up and look for trains but only saw a pathetic little, two carriage diesel effort! Barely visible here. And they charge £12 for an adult ticket, £2 for the dog. So that would be £26 for a 2 x 20 minute return then? I think we’ll wait until we get to Shackerstone and visit the twee Victorian cafe on the platform. 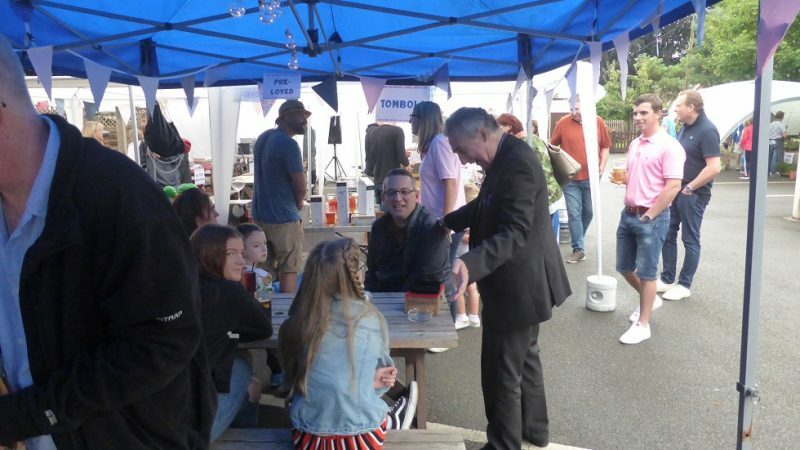 Well, the fete went well and the weather held off. Monday came and went – so did Mark on Tamsin. 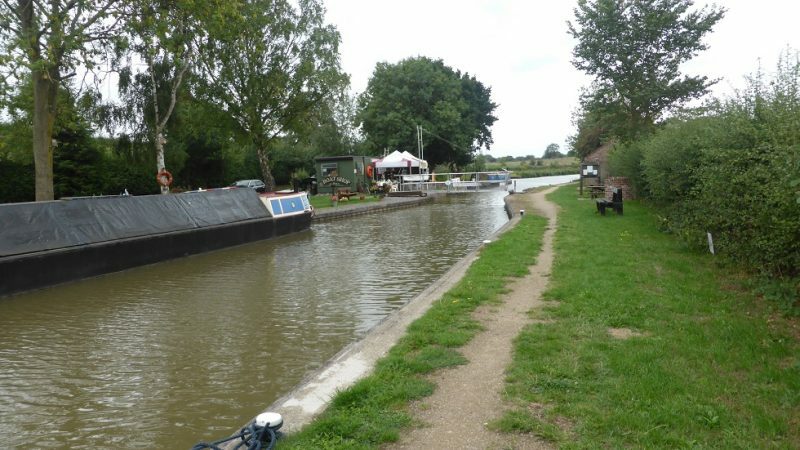 We walked the hour to Sutton Cheney Wharf and had lunch, then the hour back! 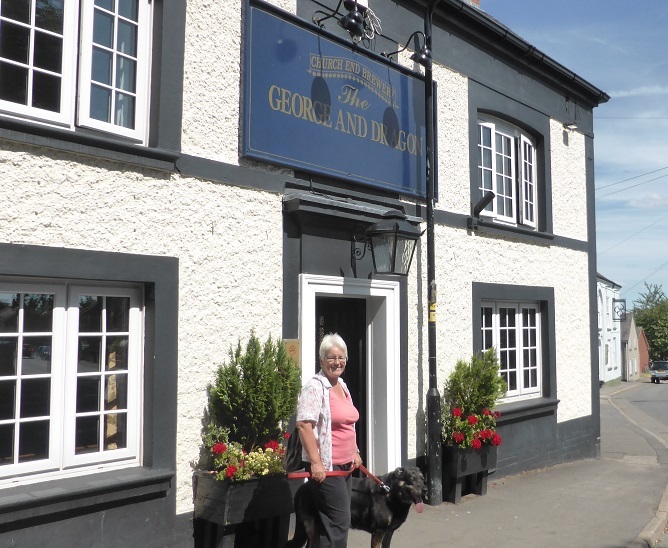 Tuesday – Viv had some eye trouble so took the bus to Nuneaton to get it looked at – all seems OK. And tonight is Steak Night at the George (they do this just once a month, so serendipitous that we are here then!). 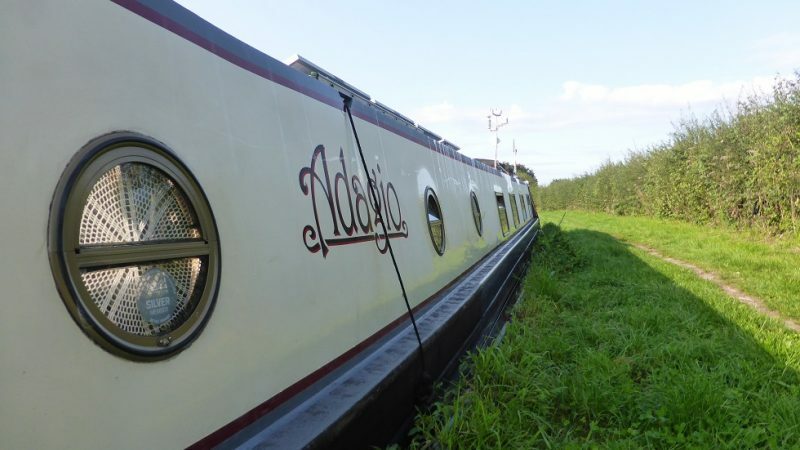 Our mooring for a few days – the new cratch looks good. 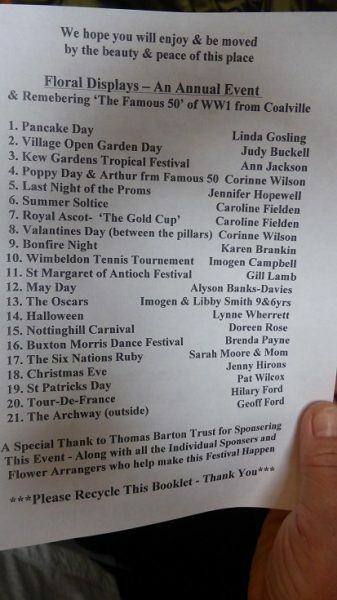 The fete behind the George & Dragon . 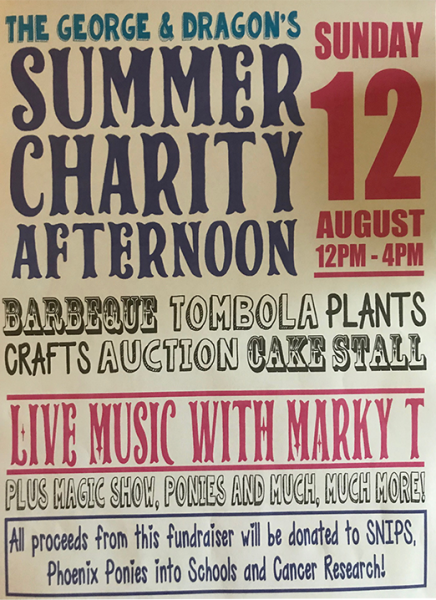 . . tombola, alpacas, hotdogs, cake stand, bric-a-brac, live music and a wandering magician, John! He spent some time with us doing the magic 5 rings joined or not joined together! 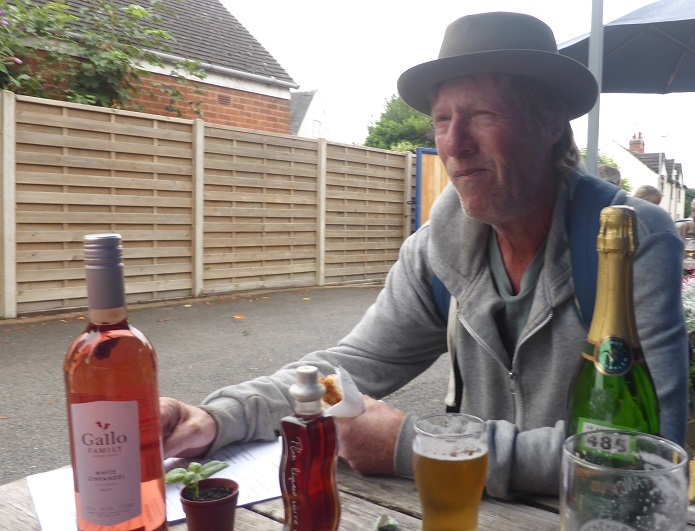 Here’s our mate, Mark – with his winnings. I got lots of jewelry and soaps, why did he get all the booze?! And of course the pub bar was in full swing with lots of staff on. Still got the eight beers . . . wonderful. 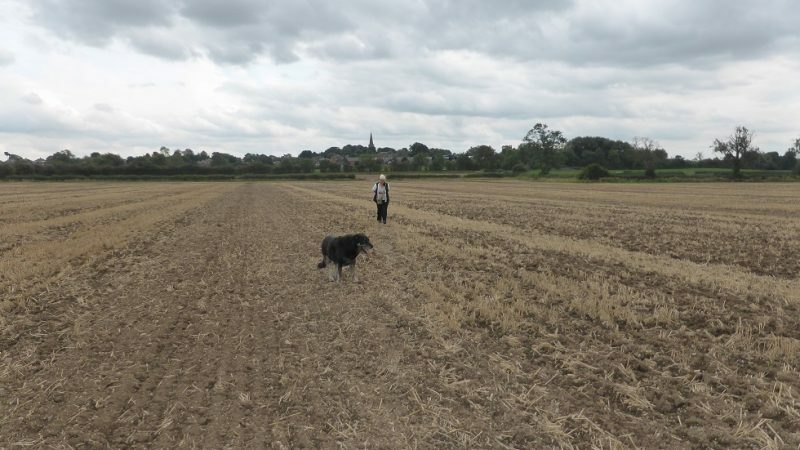 The Monday walk – it was supposed to be cooler but the sun came out again and we got a bit singed again! 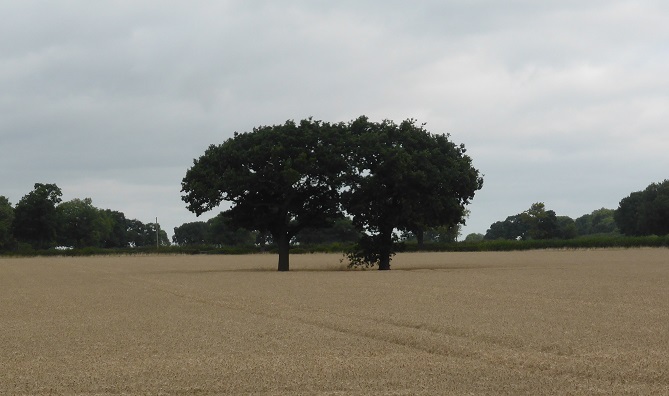 Still, it was a lovely walk, with stunning scenes, like this one – should have the The Big Country theme music to go with it. Viv was getting, by this stage, “are we there yet?”, to which I kept replying, “it’s just round that next bend”. It wasn’t. But we did get to see Viv’s boat! The objective reached. 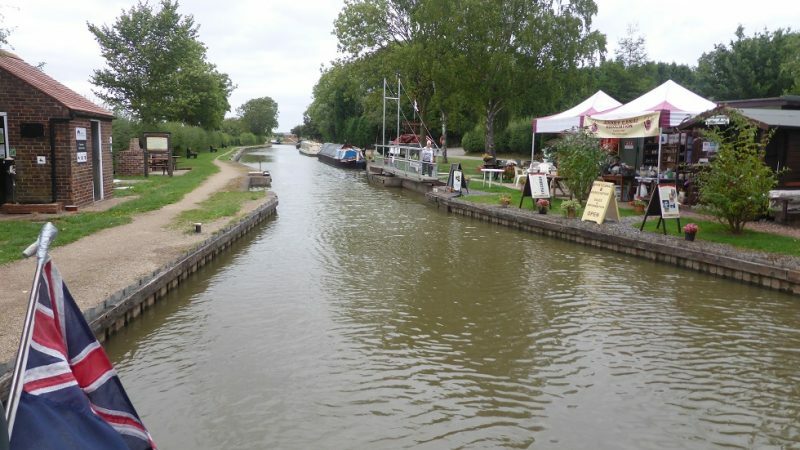 Sutton Cheney wharf and tearooms. Very nice end to the walk but a bit pricey (£17.60 for two jacket spuds with cheese & beans plus a pot of Earl Grey tea). Probably used when your wet dog came inside! 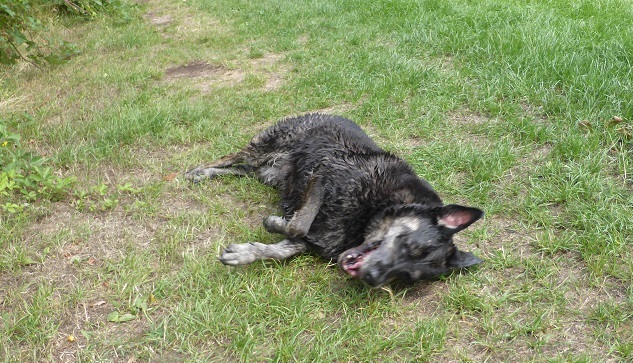 Well, we did promise Toby a swim and he was well tired and hot n bothered. 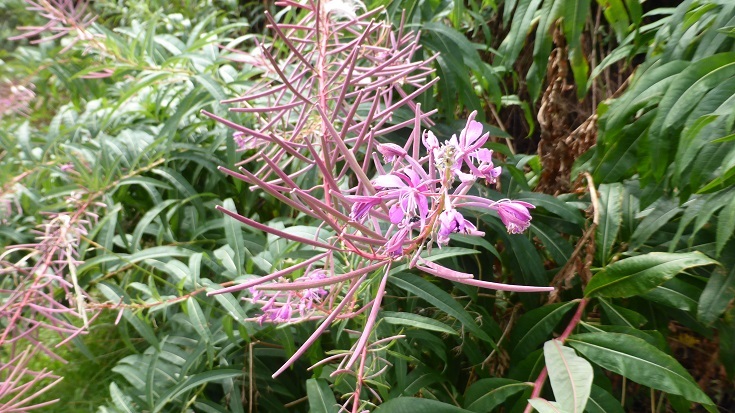 Struggling here but I think this is Great Willowherb. 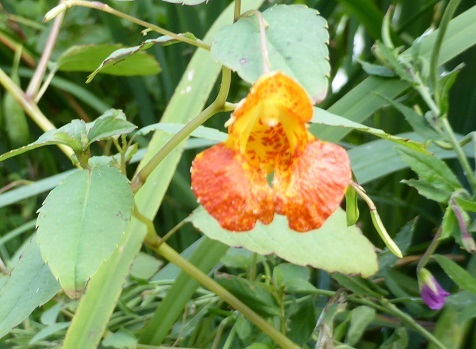 And this pretty one is mimulus or monkey flower (thanks to Viv and her collection of books!). Sounds like a cast list from an Agatha Christie novel. Well, the Ashby is definitely otherworldly and so much quieter than the last week. Yes, there are boats and boaters – some not all that great but then you meet some lovely people (such as a nice couple on Iets Groter – which means slightly larger, which their boat was). We stayed another day. Entertaining Mark and his dogs, Layla & Pancho. Always good company. We had made a huge tabbouleh (as Mark’s a veggie) with finely chopped onions, pepper, cucumber, fennel, tomatoes, celery, carrots and a mix of quinoa/bulgar wheat plus spiced up with the last of our Sicilian olive oil and a good splash of Harissa. Nice. After that Cava, white wine, brandy . . Friday just came and went. Saturday we moved further on . 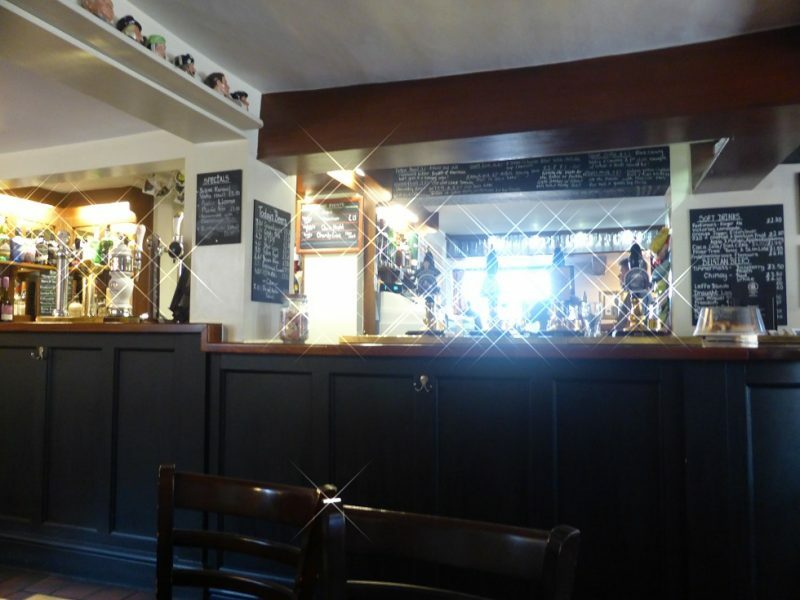 . . one slight incentive was that our favourite pub (perhaps ever) only does food Tues-Sat and only at lunchtime. 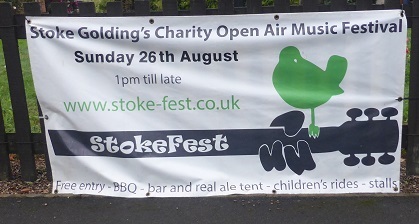 So we had to get to Stoke Golding by 12 ish and we did. 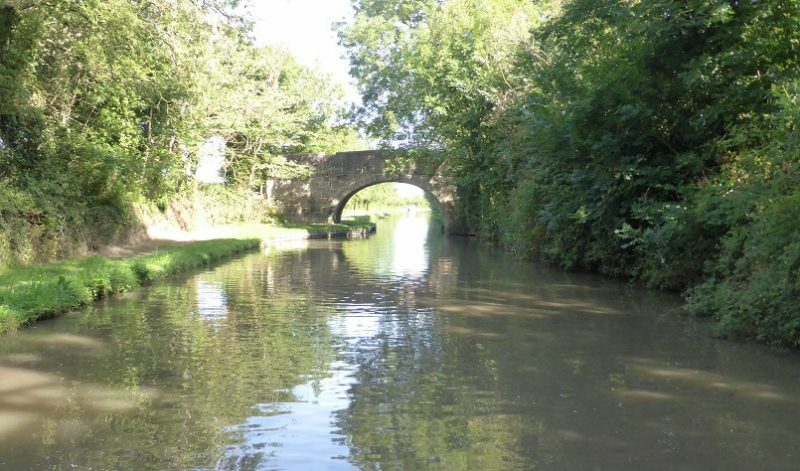 Narrow cutting from bridge 5 – weather turned out quite good. 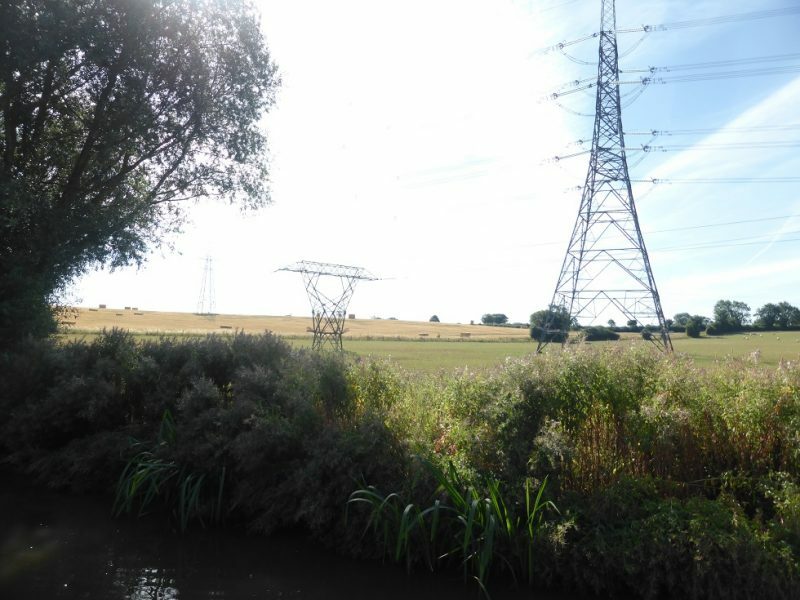 I remember these diddy pylons from last time. Yes, Viv’s in the middle of the picture . . . shiny boat. Journey’s end, for today. 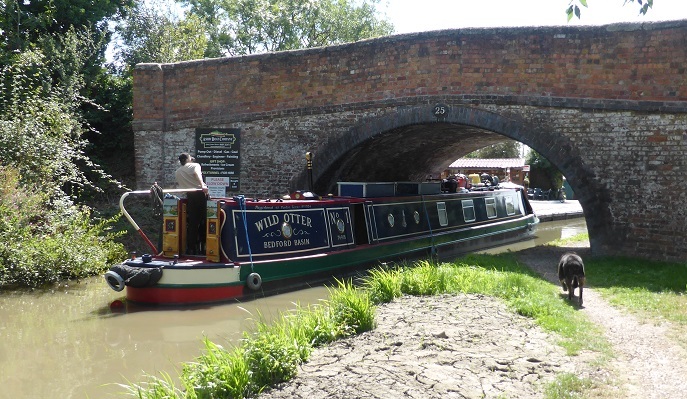 Here’s one for Gail – a boat called Wild Otter, pulling into Stoke Golding wharf. 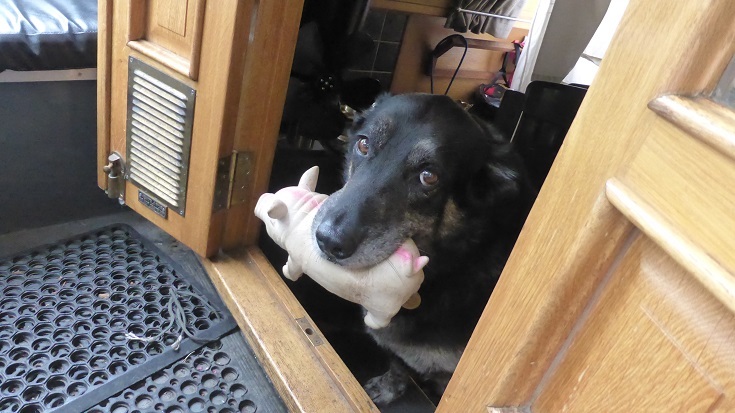 Toby’s heading for the pub! 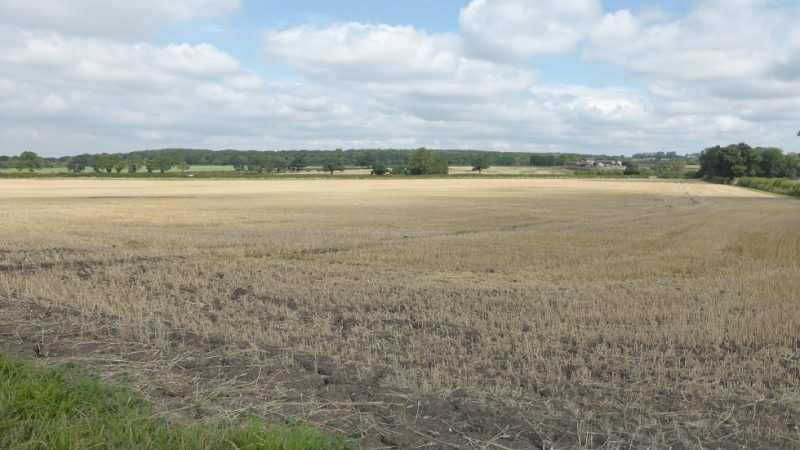 The area is famous for the battle of Bosworth. Stoke Golding seems to have more than its fair share of blue plaques and also I don’t think they let you live here unless you have a personalised number plate. Never mind. Top of the hill and there stands the George & Dragon. 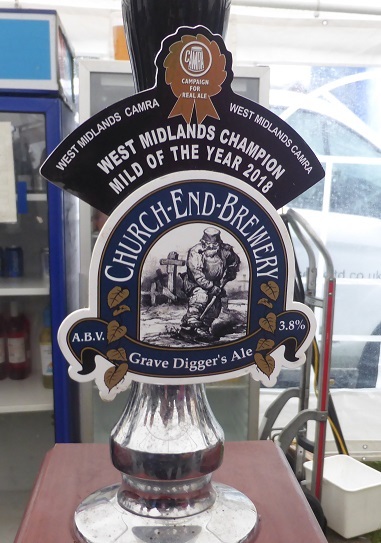 The first pub owned by the Church End brewery and stocking a lot of their excellent beers . . . Eight, yes, eight of their beers on! We know most of these except the last two which we had to try and jolly good they were too. 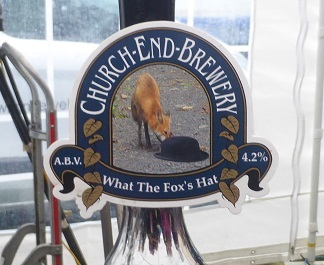 (WTFH stands for What the Foxes Hat, yes, you say it out loud!). Stout coffin is one of my favourites. As is their homemade, shortcrust pastry pies. 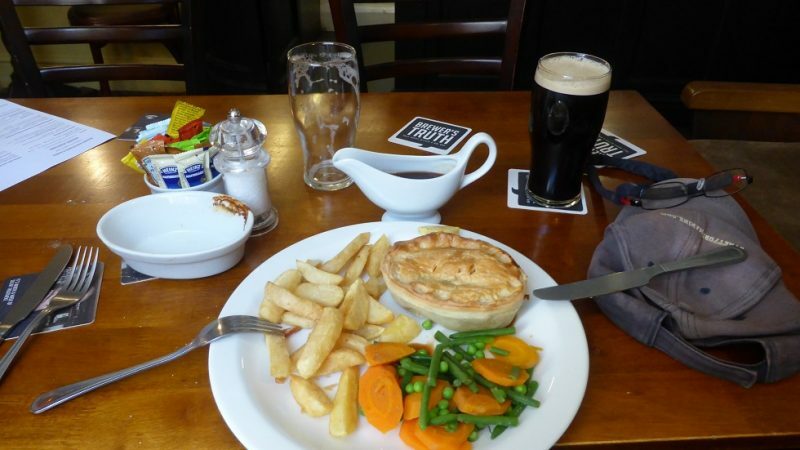 Very thin pastry and stuffed full of beef & ale. No surprise air pockets or gristle here. 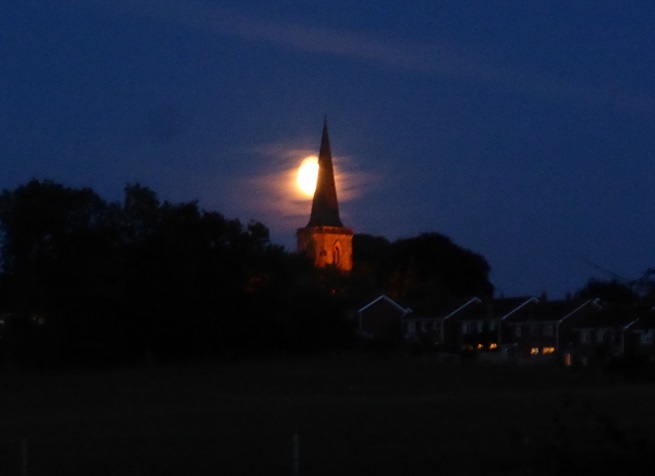 We stagger back (all downhill) a different route – past one of the best churches in Leicestershire (one for Jenny?). Must have a look inside over the next few days.